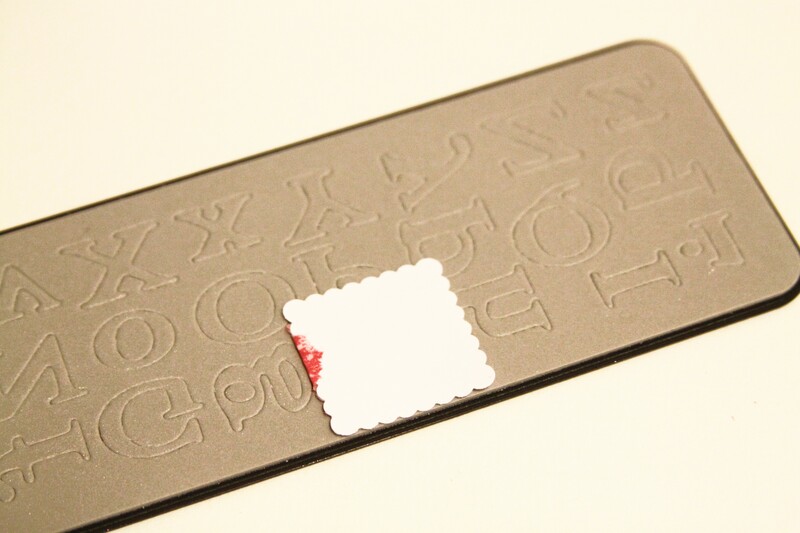 Remember, all of my Number Tags are cut from the Hollyday Man with All the Toys Patterned Paper by American Crafts. For Day 19, I used Elf Glossy Chipboard Thickers and snowflake patterned paper from the Dear Lizzy Christmas Collection by American Crafts. I used Peppermint St. Nick Patterned Paper by Crate Paper. I also used my Black Zig Writer Pen for the journaling. 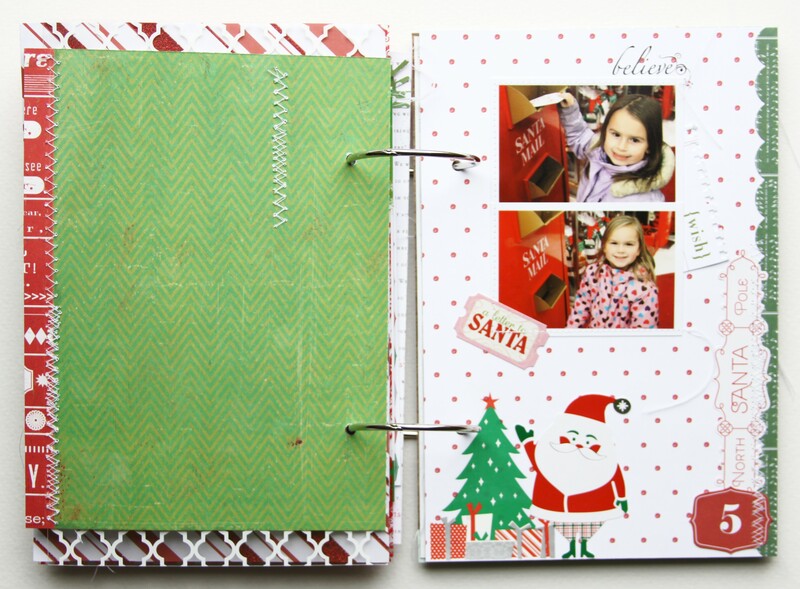 For Day 20, I used Peppermint Present Patterned Paper (the trim) by Crate Paper. 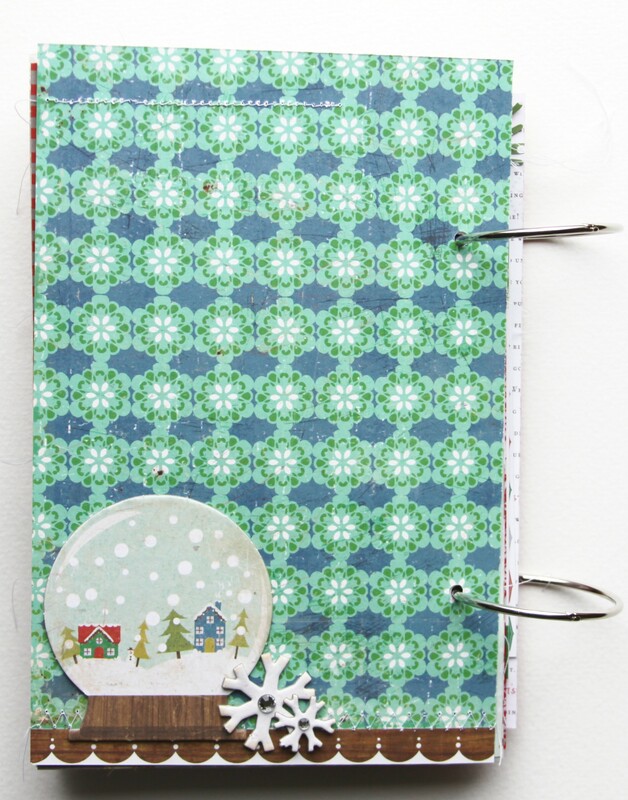 For Day 21, I used Peppermint Snow Globe Patterned Paper by Crate Paper. I used the Margarita Collection Iguana Thickers by American Crafts. I also used my Black Zig Writer Pen for the journaling. 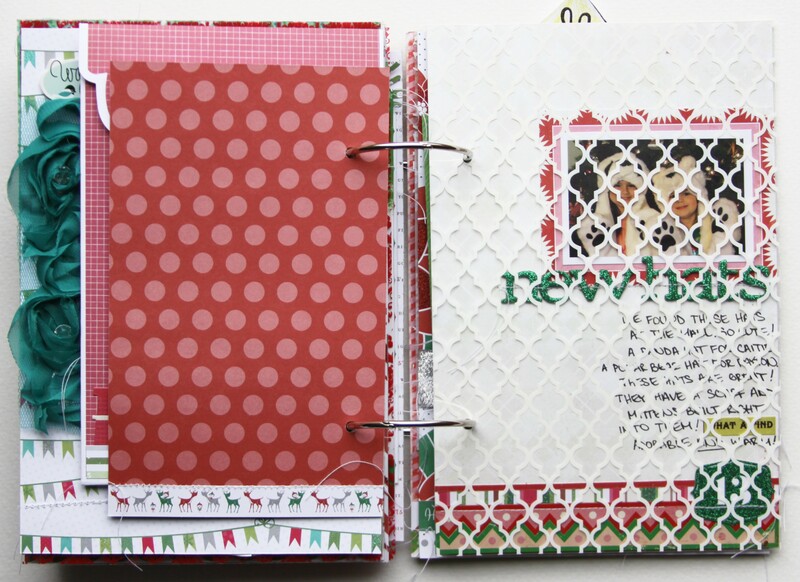 I used the Brocade Overlay (HO652) and the White (R592) Holiday Reindeer Rub-Ons by Hambly Screen Prints. 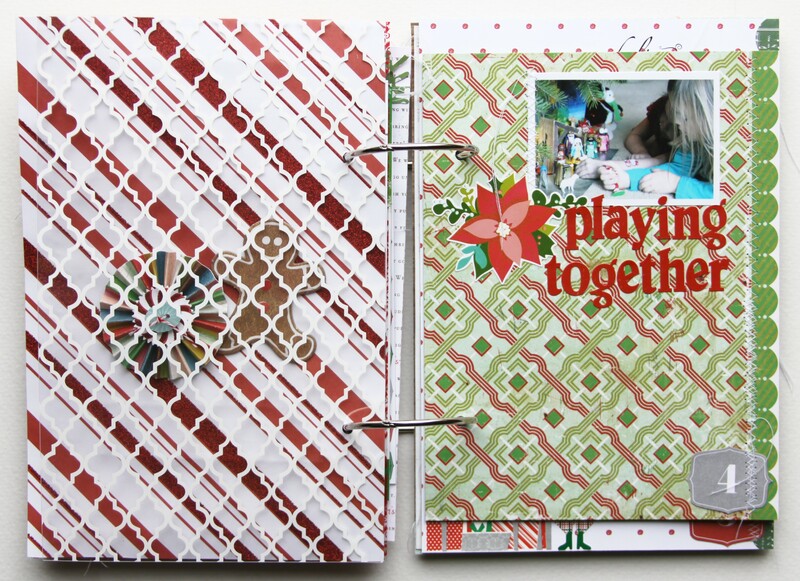 For Day 22, I used Hollyday Kris Kringle Patterned Paper (the trim) and Elf Glossy Chipboard Thickers by American Crafts. 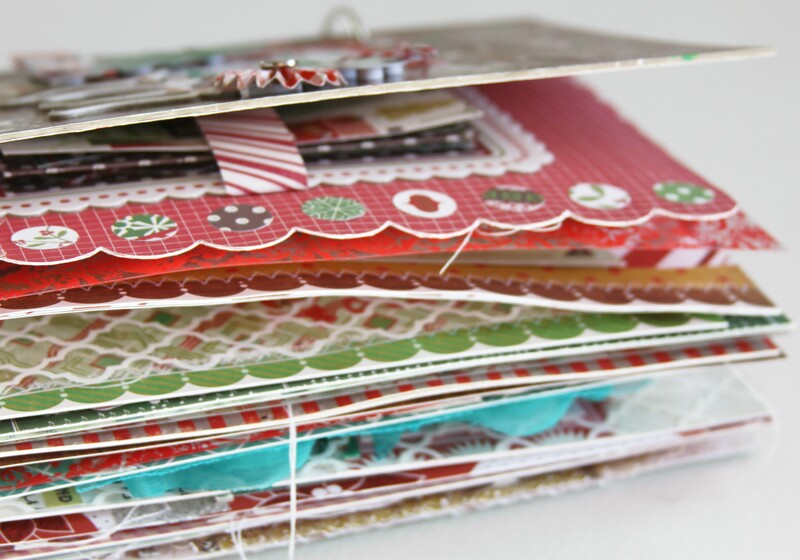 I used Peppermint Wintergreen Patterned Paper by Crate Paper. I also used my Black Zig Writer Pen for the journaling. 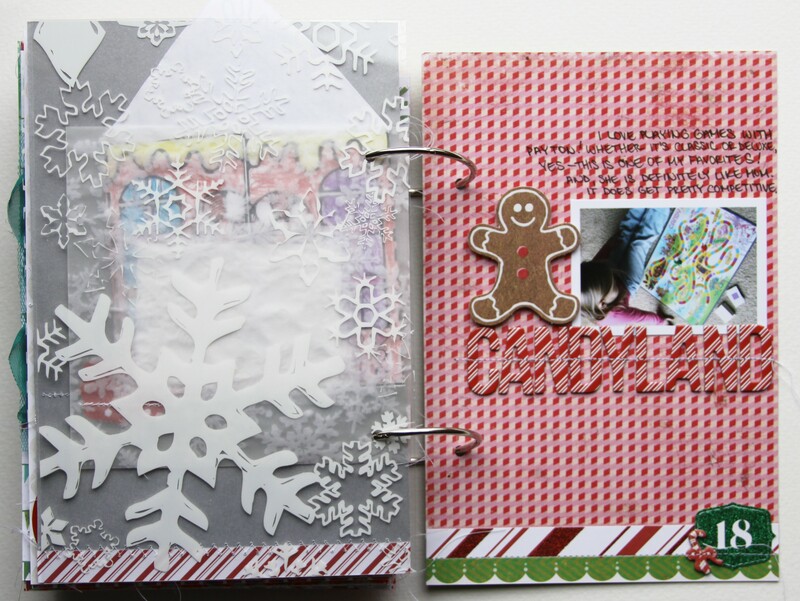 For Day 23, Hollyday Santa Baby and Sinterklaas Patterned Papers, Hollyday North Pole Remarks Accents and Phrases Sticker Books, Hollyday House Printed Shapes, Elf Glossy Chipboard Thickers by American Crafts. I also used my Black Zig Writer Pen for the journaling. For Day 24, I used POW! 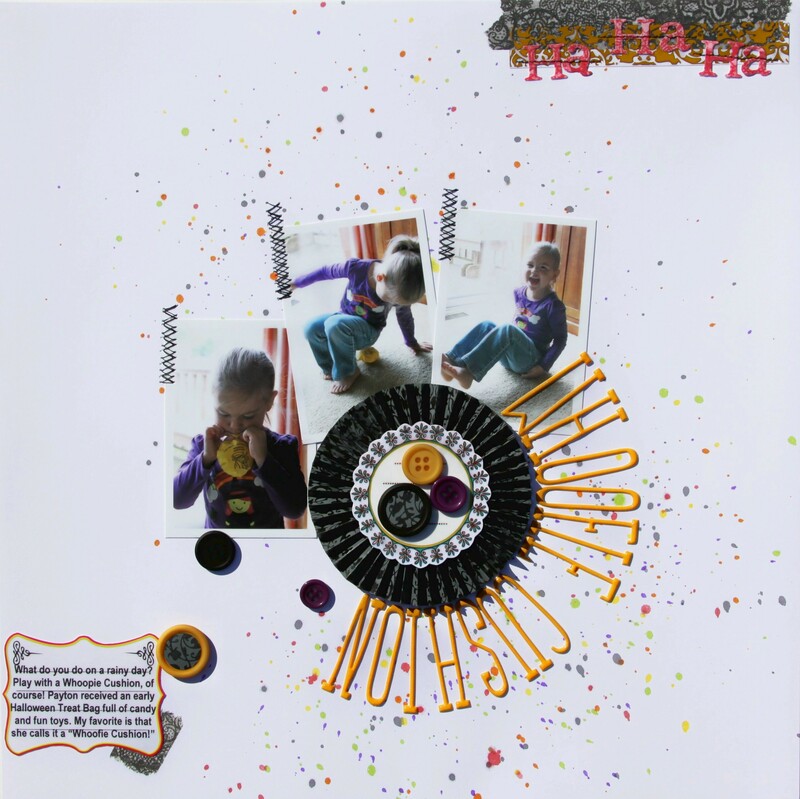 Glitter Paper Charcoal Dot, Hollyday Glitter Button, Rockabye Glitter Chipboard Thickers, and Dear Lizzy Christmas Mixtape by American Crafts. 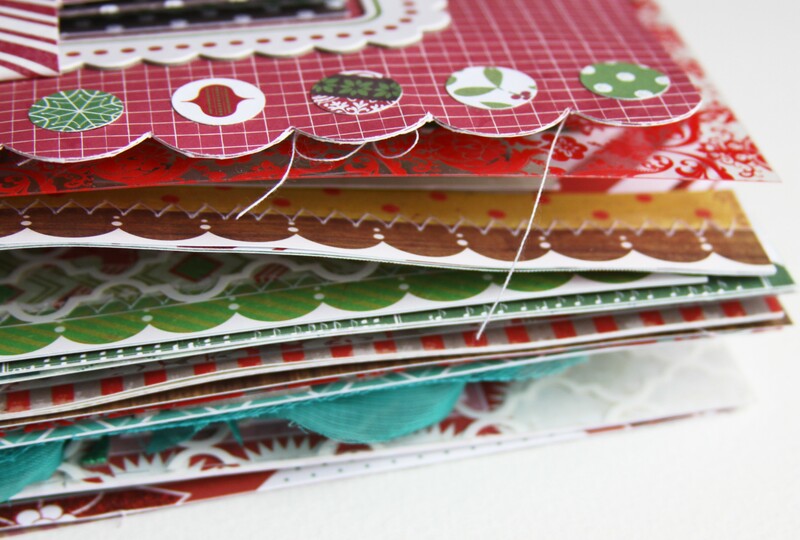 I used Accent Cuts and Gingerbread Patterned Papers by Crate Paper. I also used Silver Sugar and Snow Queen Glimmer Mists by Tattered Angels, Gold Stickles by Ranger Industries, and white tulle with flock dots. The reversible gold/silver vintage ribbon I used is from my Mom. She got it a while back from Hallmark…a spool of 24 feet for .50. It’s called “Sheer Tye.” Isn’t it just so pretty!? 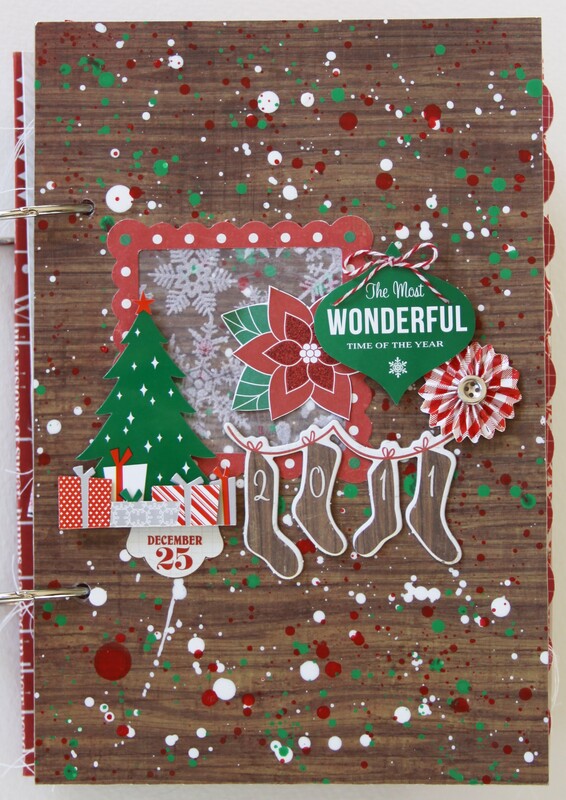 For Day 25, I used Hollyday Santa Claus, Kris Kringle, and Whiskers Patterned Papers, Reindeer Glitter Chipboard Thickers, Dear Lizzy Christmas Mixtape, Hollyday Glitter Button, and Hollyday Peppermint Delights Pinwheel Flower by American Crafts. 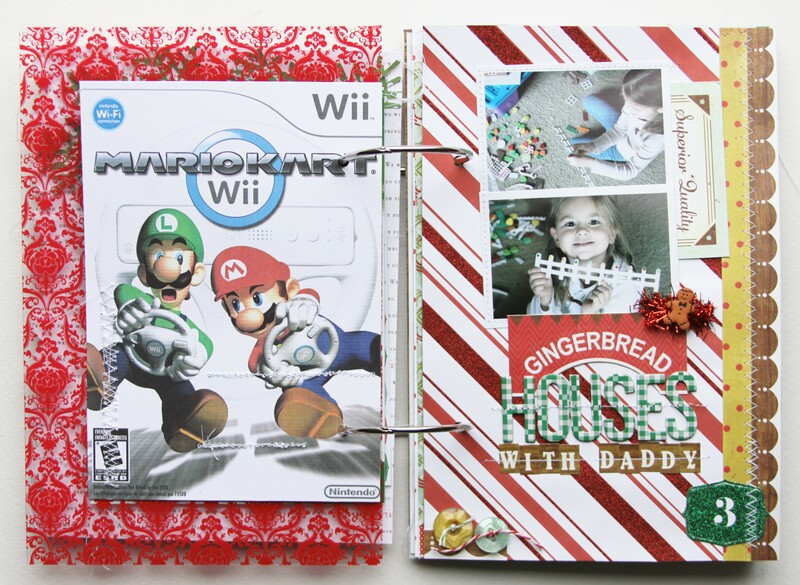 I used Peppermint Chipboard Accent Stickers, Peppermint Button, and Peppermint Border Sticker by Crate Paper. I also used Marshmallow Glimmer Mist by Tattered Angels, Candy Cane, Frosted Lace, Holly, and Xmas Red Stickles by Ranger Industries, and white tulle with flock dots. 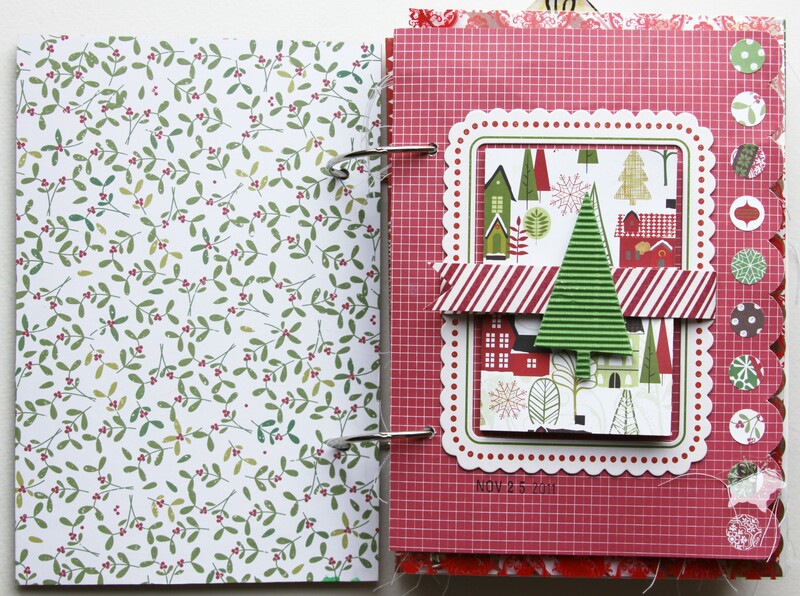 …and then Peppermint Ski Lodge Patterned Paper by Crate Paper on the other side. 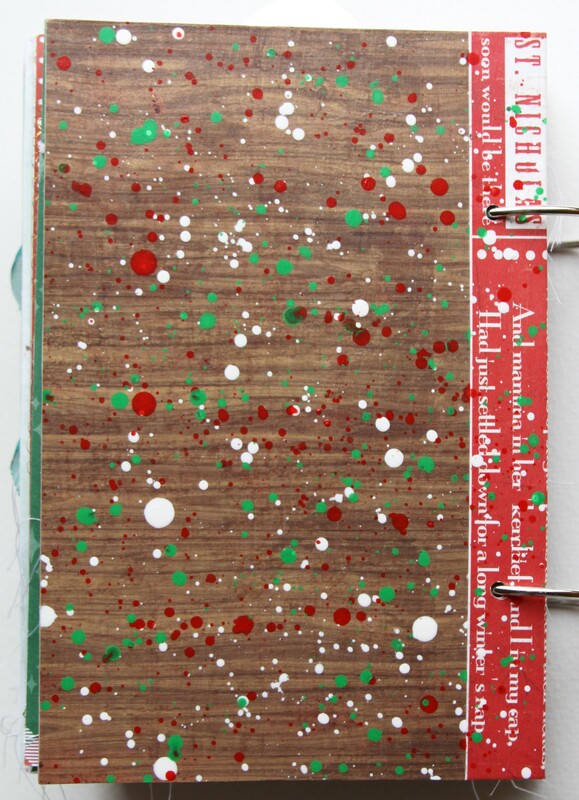 For the Back Cover, I also wrapped one edge of both sides with Peppermint St. Nick Patterned Paper by Crate Paper. 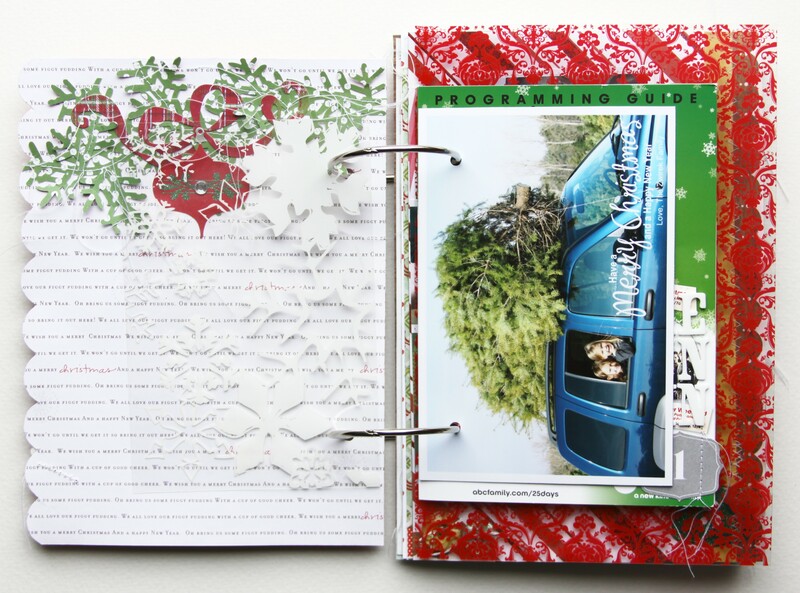 On the Back and Front Covers, I splattered the Peppermint Ski Lodge Patterned Papers by Crate Paper with Grass Stains, Red Wagon, and Spotlight Scrapbook Colors by Making Memories and then added a layer of Mod Podge to seal in all the paint splatters. SO FUN AND PRETTY! I LOVE THESE COVERS! 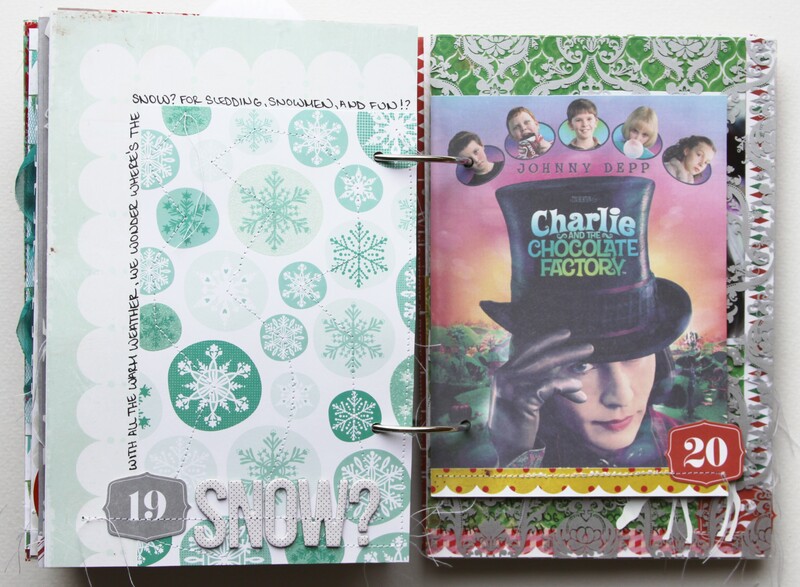 For the Front Cover, I used a piece of flocked snowflakes vellum paper in the Peppermint Die Cut Frame by Crate Paper. 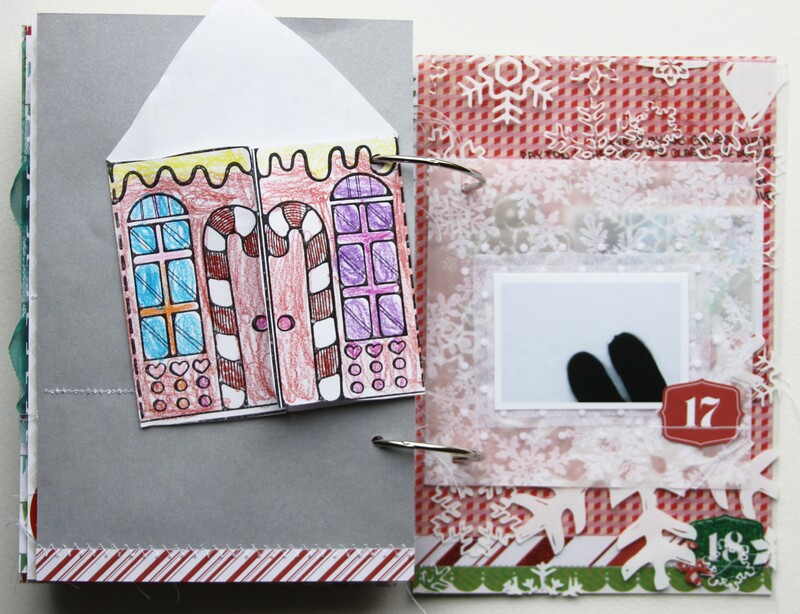 I used Hollyday Frosty miniMarks Rub-On Letter Transfers (the 2011) by American Crafts with the Peppermint Chipboard Accents (the hanging stockings) by Crate Paper. I used Hollyday Rose Lips Patterned Paper, Hollyday Poinsettia Remarks Dimensional Stickers, Hollyday Peppermint Delights Pinwheel Flowers, and Hollyday North Pole Remarks Accents and Phrases Sticker Books by American Crafts. 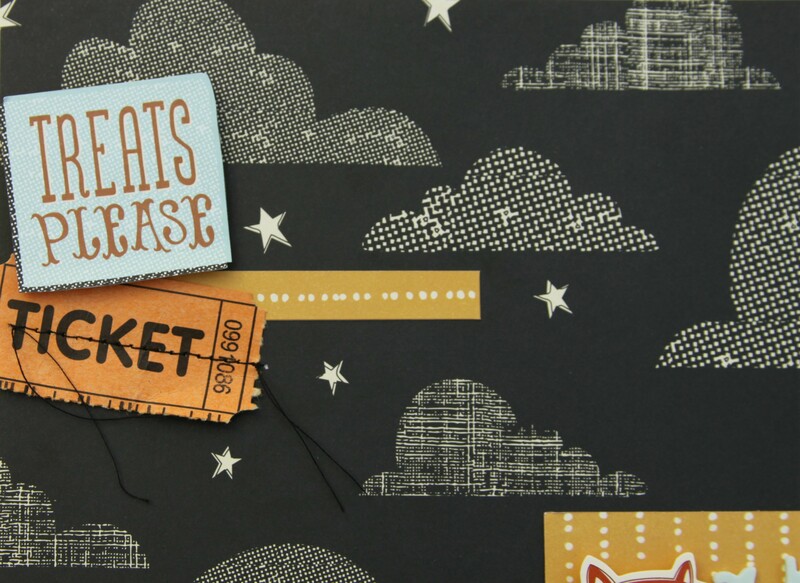 I also used Peppermint Alpha Labels by Crate Paper and Wonder and Wishes Twine by Little Yellow Bicycle. 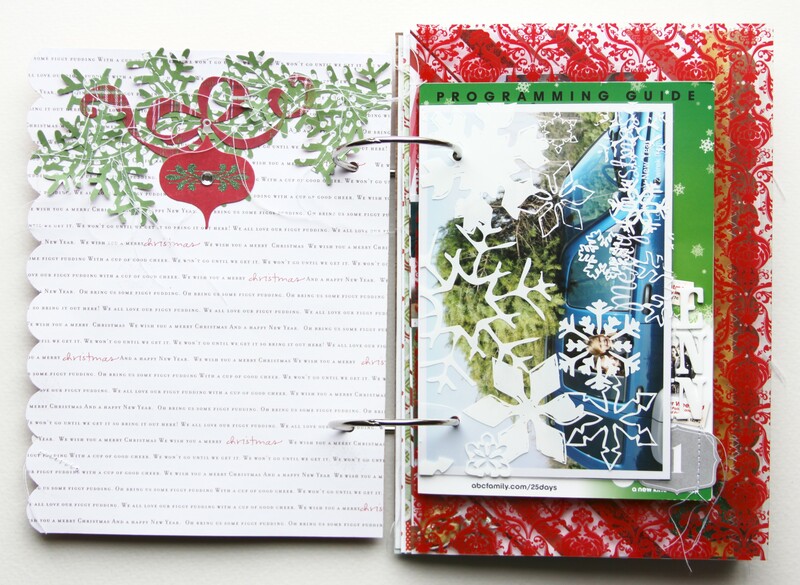 Office Depot 2-inch Book Rings (Item #212-257 -comes in a 25 ct.), Black Zig Writer Pen, Mini Glue Dots, Herma Tabs, Mod Podge, Circle Foam Tabs by American Crafts, vellum, scissors, white thread, and sewing machine. I used the Mini Brocade Overlay (HO844) by Hambly Screen Prints. For Day 10, I used Elf Glossy Chipboard and Reindeer Glitter Chipboard Thickers and items from the Dear Lizzy Christmas Collection by American Crafts. I also used my Black Zig Writer Pen for the journaling and white tissue paper with some of Chris’ birthday wrapping paper. 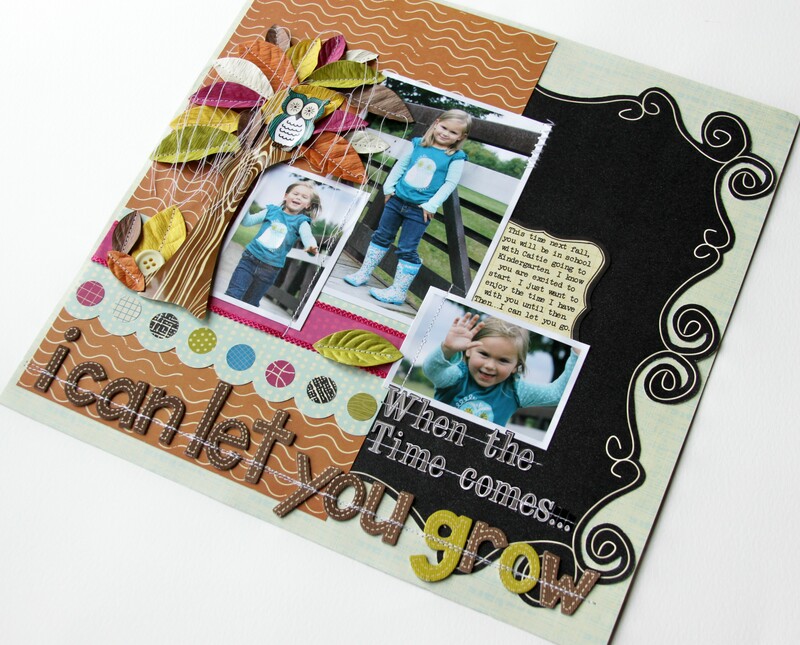 For Day 11, I used Rockabye Glitter Thickers by American Crafts. 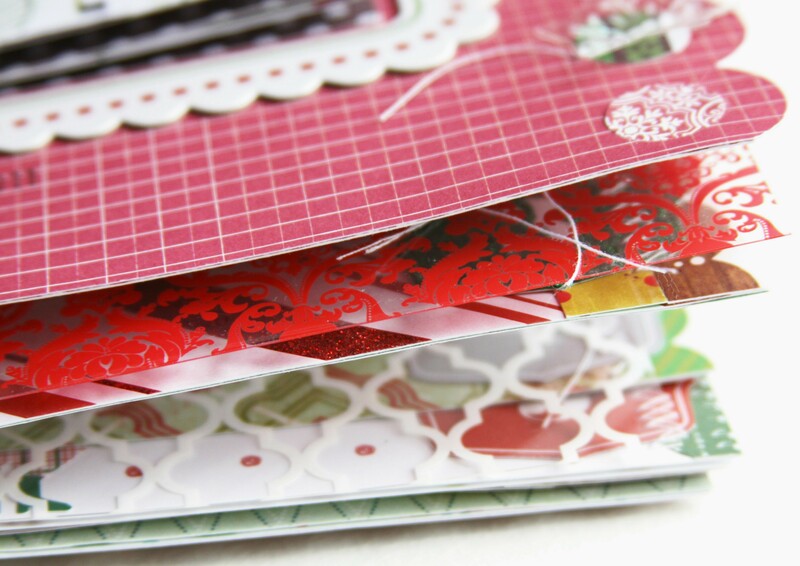 I used an Envelope with its matching Insert from the Medley Album Kit, Simple Stripe Patterned Paper, Cardstock Stickers – Favorite Pieces, and red Pom Poms by Little Yellow Bicycle. 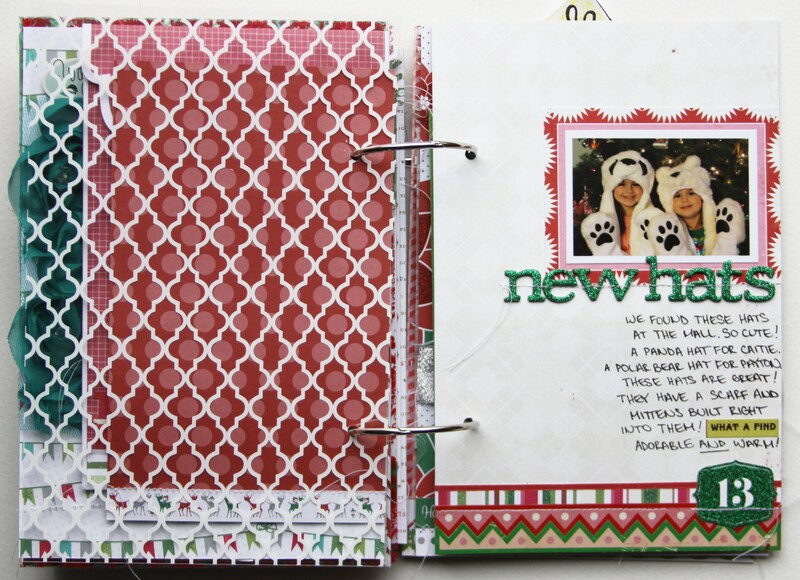 For Day 12, I used Reindeer Glitter Chipboard Thickers and Hollyday Bellsnickel and Babouschka (the trim) Patterned Papers by American Crafts. 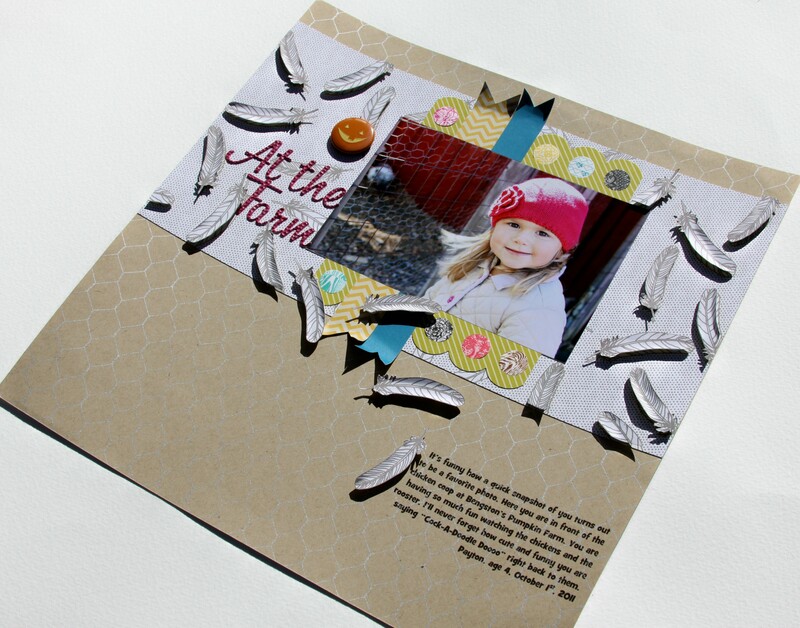 I also used Cardstock Stickers – Favorite Pieces by Little Yellow Bicycle and my Black Zig Writer Pen for my journaling. 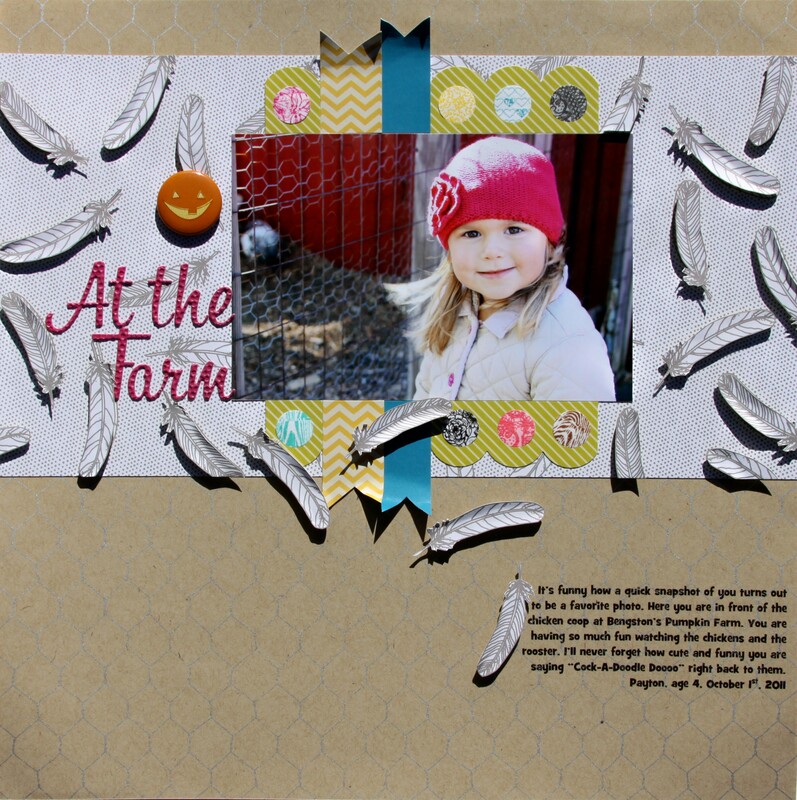 I used the Lattice Overlay (HO835) by Hambly Screen Prints. 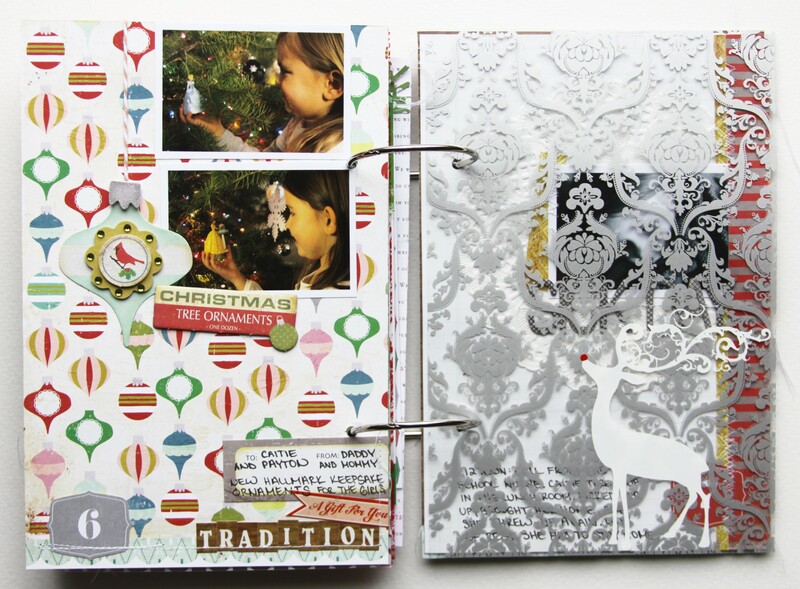 For Day 13, I used Reindeer Glitter Chipboard Thickers and a Dear Lizzy Christmas Patterned Paper by American Crafts. 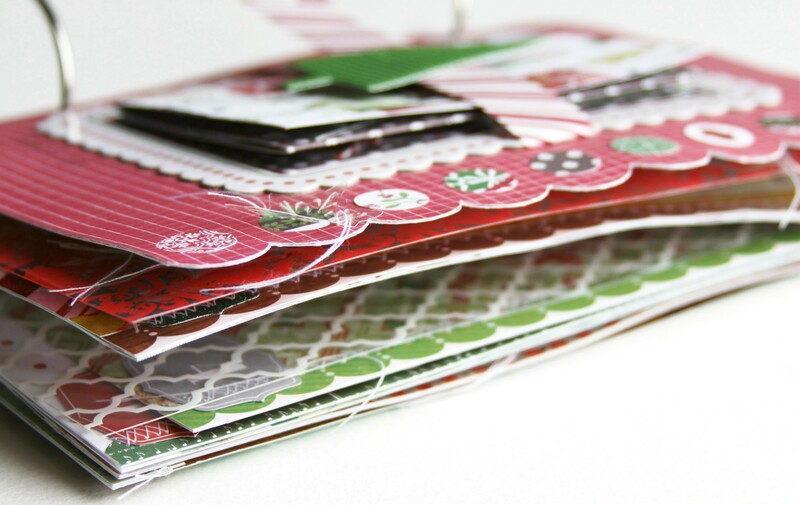 I used Peppermint Candy Cane, Accent Cuts, and Gingerbread Patterned Papers, Peppermint Border Stickers, and Farmhouse Collection Alpha Labels (“what a find” phrase) by Crate Paper. 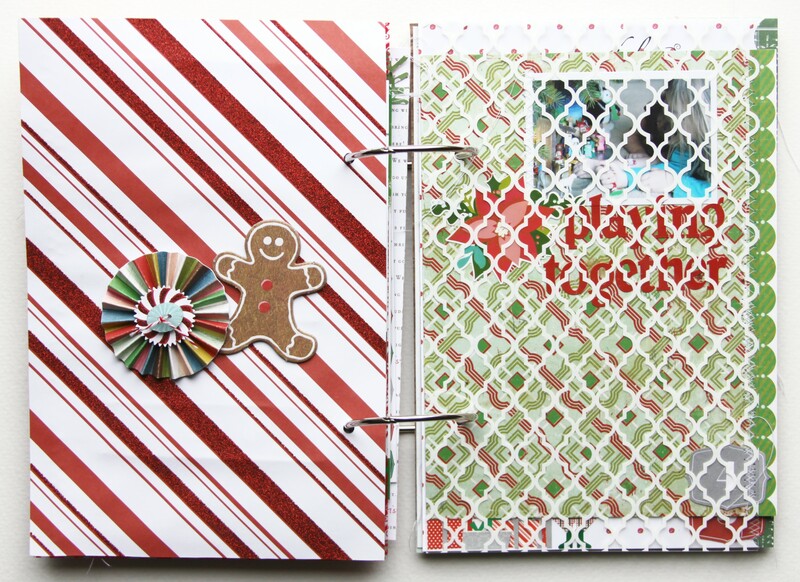 For Day 14, I used Peppermint Candy Cane, Gingerbread, and Snow Globe Patterned Papers, Peppermint Stickers Sheet, and Peppermint Buttons by Crate Paper. 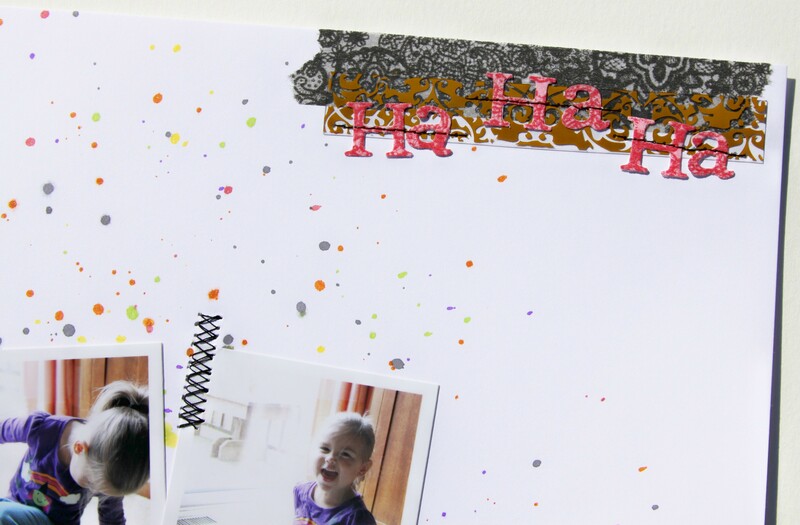 I also used Glass Slipper Glitter Puffy Thickers by American Crafts and my Black Zig Writer Pen for my journaling. 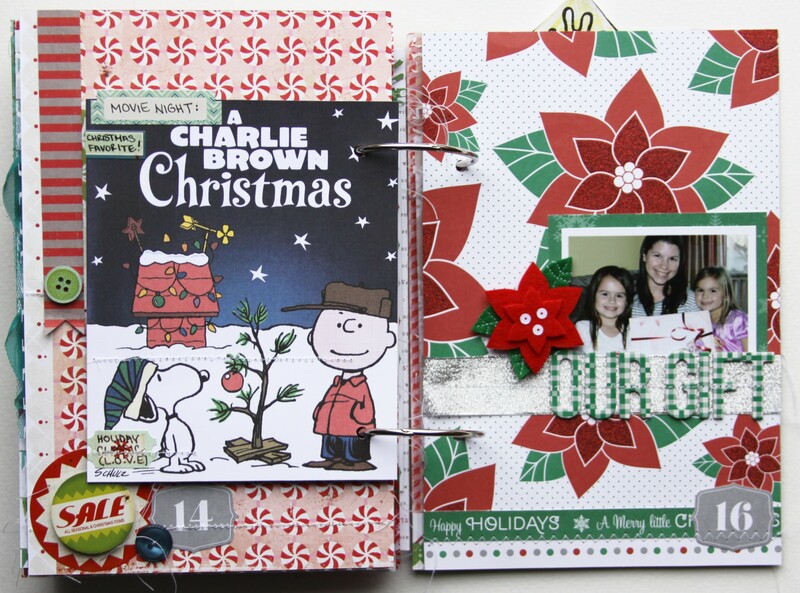 For Day 15, I used Peppermint 6 x 6 Paper Pad, Peppermint Border Stickers, and Peppermint Stickers Sheet by Crate Paper. 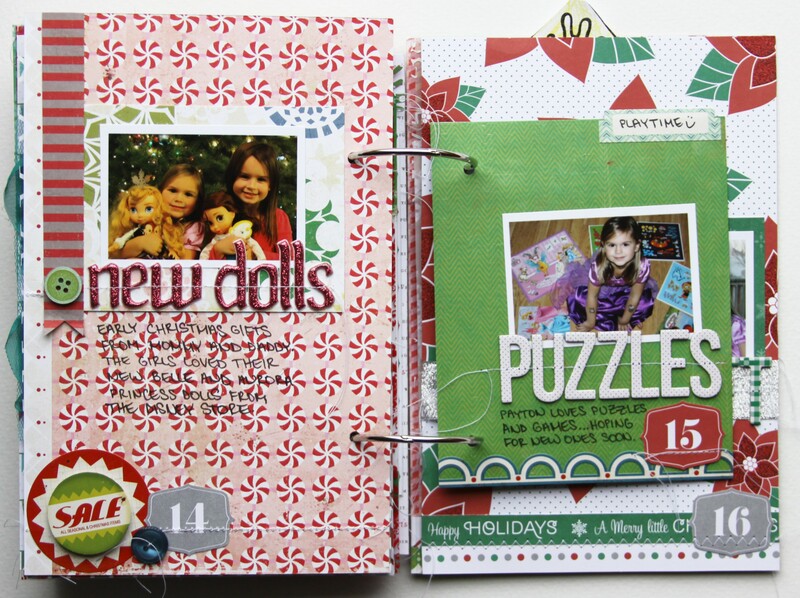 I also used Elf Glossy Chipboard Thickers by American Crafts and my Black Zig Writer Pen for my journaling. 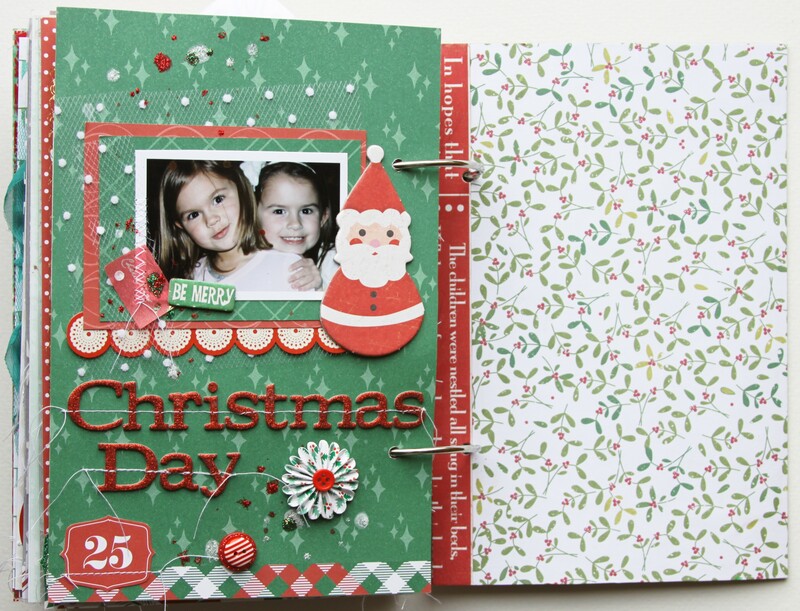 For Day 16, I used Hollyday Rose Lips, Merry Dimples (the trim), and Old Man Winter (the trim) Patterned Papers, Hollyday Bright Details, Hollyday Garland Ribbon, and Elf Glossy Chipboard Thickers by American Crafts. For Day 17, I used a white, flocked snowflake vellum paper, white tissue paper, and white tulle with flock dots (all from my local Hobby Lobby store). 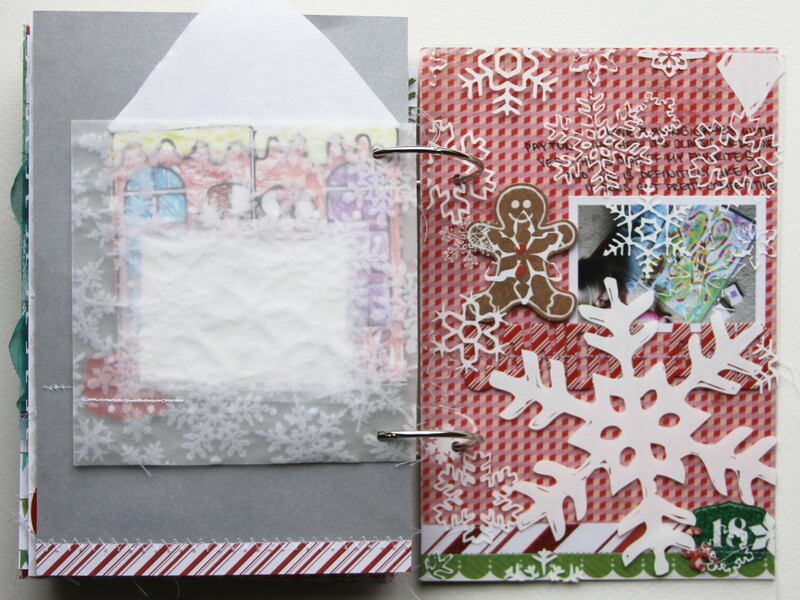 I used the Frosty Snowflakes Overlay (HO541) by Hambly Screen Prints. For Day 18, I used Peppermint Mint and Wintergreen Patterned Papers, Peppermint Chipboard, and Peppermint Die Cut by Crate Paper. 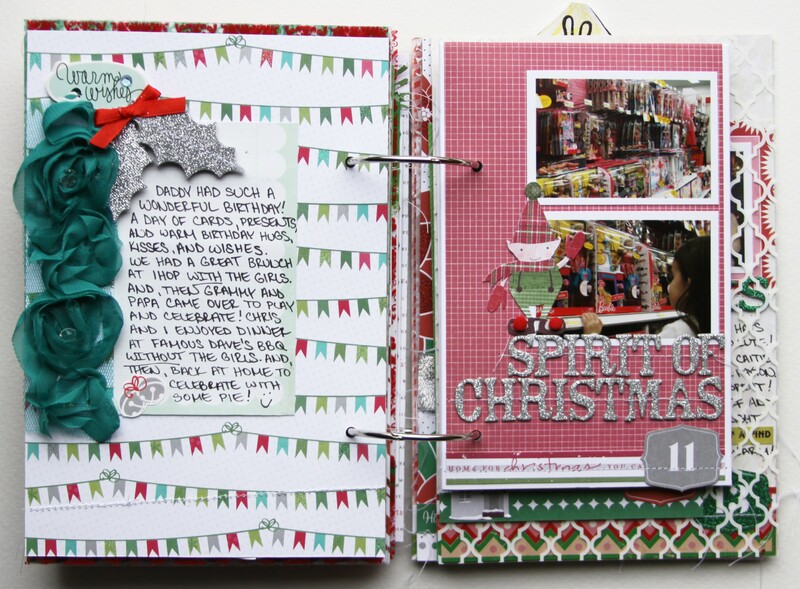 I used Elf Glossy Chipboard Thickers and Hollyday Red Suit Patterned Paper by American Crafts and my Black Zig Writer Pen for my journaling. 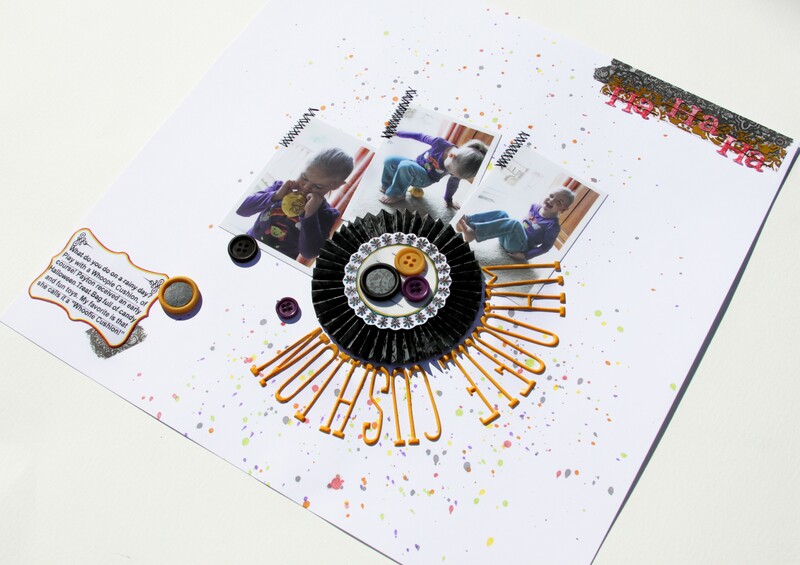 Black Zig Writer Pen, Zig 2-Way Glue Pen, Mini and Memory Book Glue Dots, Herma Tabs, Circle Foam Tabs by American Crafts, vellum, tissue paper, birthday wrapping paper, Circle Clever Lever Craft Punches by Marvy Uchida, scissors, black velcro square, white thread, and sewing machine. …our Christmas Card. This is my Favorite photo! LOVE IT! For my DD, I decided to decorate the back of my Christmas Card. I used Hollyday Man with the Bag Patterned Paper and Dear Lizzy Christmas Sleigh Accents Rub-On Transfers by American Crafts. 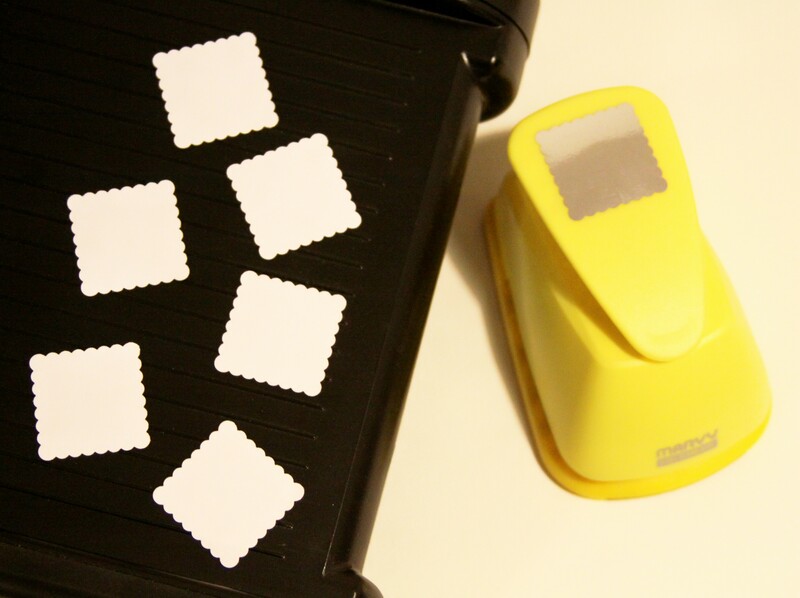 Remember, all of my Number Tags are cut from the Hollyday Man with All the Toys Patterned Paper by American Crafts. 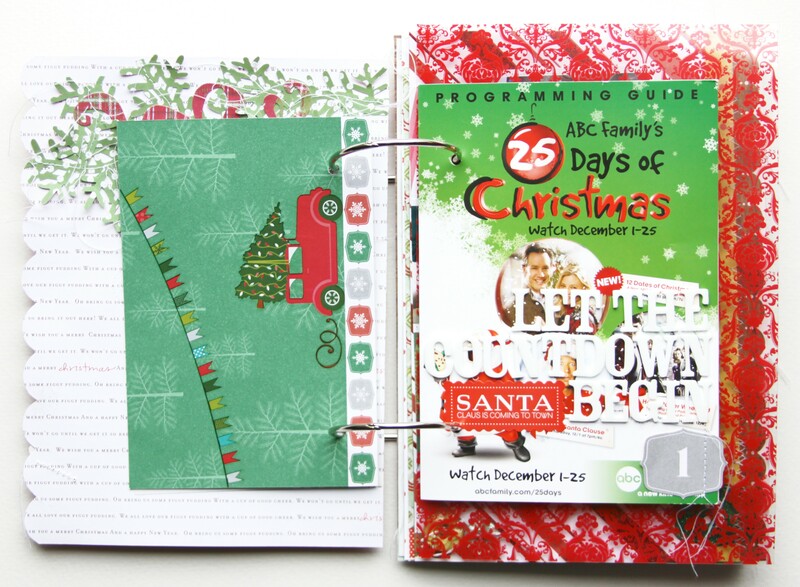 For Day 1, I used a Christmas Program Guide from the Disney Store. 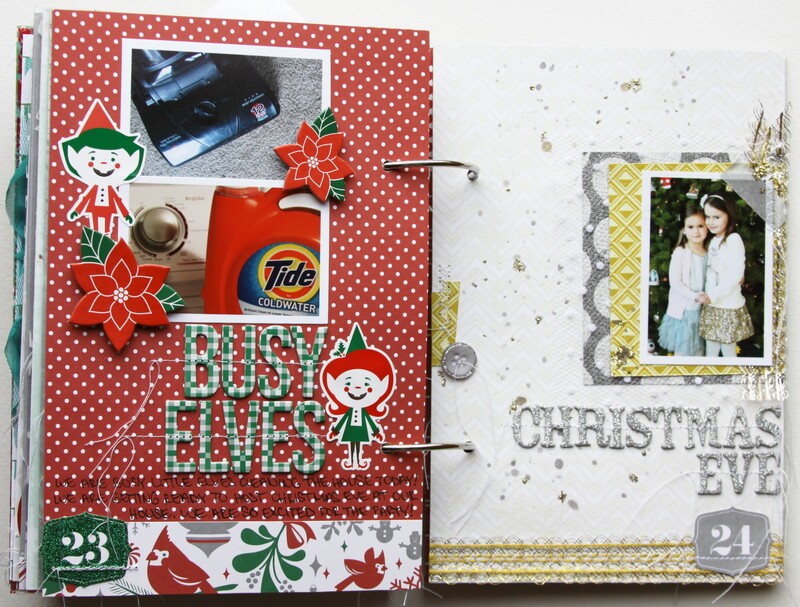 I used White Rockabye Foam Thickers and the “Santa Claus is Coming to Town” Sticker (which was the Holiday movie we watched that night) from the North Pole Accents and Phrases Sticker Book by American Crafts. The Mini Brocade Overlay (HO844) by Hambly Screen Prints. For Day 2, I used Dear Lizzy Christmas Patterned Paper, Silver Elf Glossy Chipboard Thickers, and Hollyday Buttons by American Crafts. I also used the Mod Circles Overlay (HO637) by Hambly Screen Prints. For Day 3: I used Hollyday Red Suit and Kris Kringle Patterned Paper, Green Elf Glossy Chipboard Thickers, and Hollyday Red Tinsel Ribbon by American Crafts; Peppermint Present, Ski Lodge, and Accent Cuts Patterned Paper, Chipboard Accents, Alpha Labels, Buttons, and Stand Outs by Crate Paper; and the Wonder and Wishes Twine and Canvas Tape Rolls by Little Yellow Bicycle. The little gingerbread man attached to the Red Tinsel is from the Dress It Up Christmas Buttons “I Believe” from my local Michael’s store. 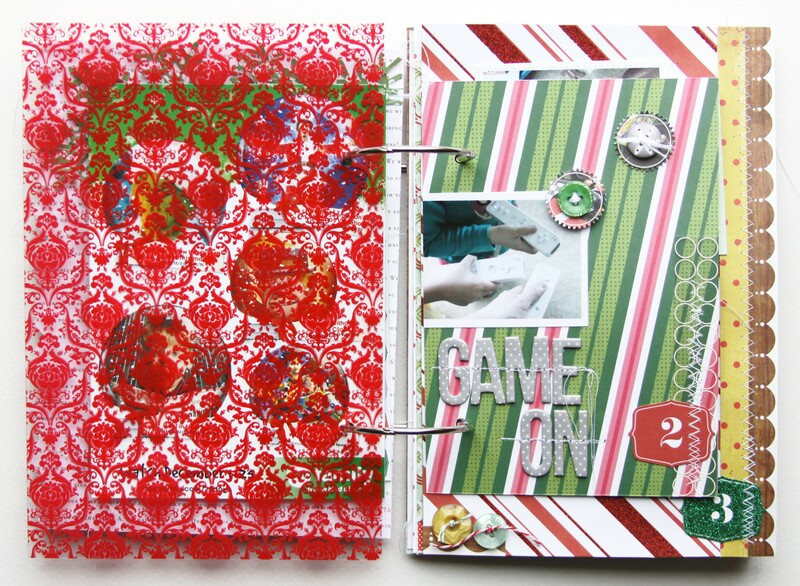 For Day 4, I used Peppermint St. Nick and Mint Patterned Papers and Alpha Labels by Crate Paper. I also used a sticker from the Dear Lizzy Christmas Mittens Remarks Accent Stickers. For Day 5: I used the Wonder and Wishes Little Red Hot Dot Patterned Paper, Cardstock Stickers Favorite Pieces, and Journaling Card by Little Yellow Bicycle; Peppermint Alpha Labels by Crate Paper; Hollyday North Pole Remarks Accents and Phrases Sticker Book and Stocking miniMarks Accents and Phrases Rub-On Transfers by American Crafts; and the “believe” word Wholy Cow! Rub-On Transfers by BasicGrey. 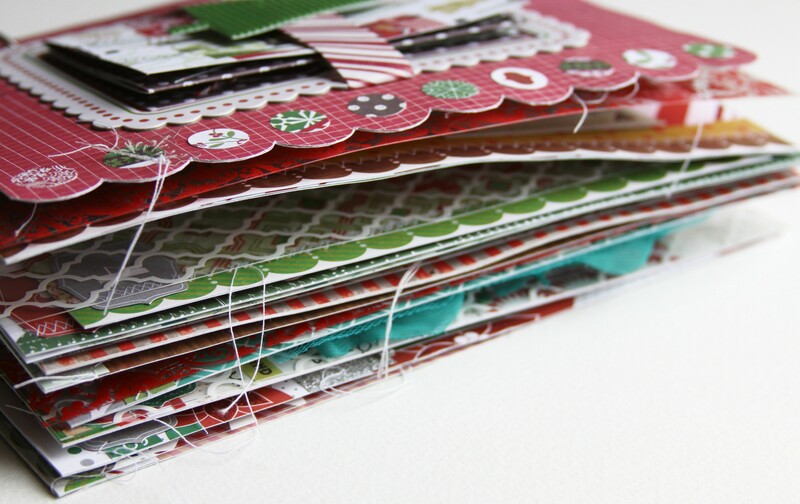 For Day 6, I used Peppermint Embellish and Present Patterned Papers, Alpha Labels, Chipboard Accents, Stand Outs, and Trims by Crate Paper. I also used my Black Zig Writer Pen for the journaling. 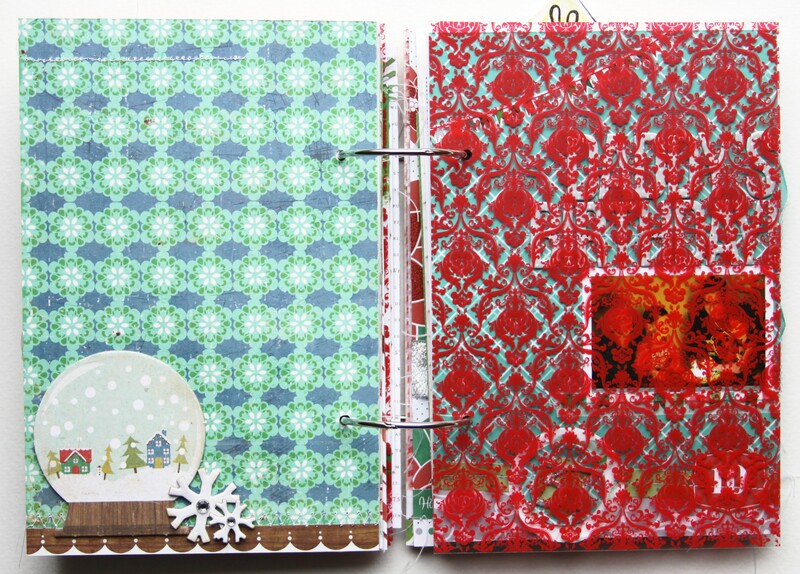 I used the Brocade Overlay (HO652) and the Red (R594) and White (R592) Holiday Reindeer Rub-Ons by Hambly Screen Prints. 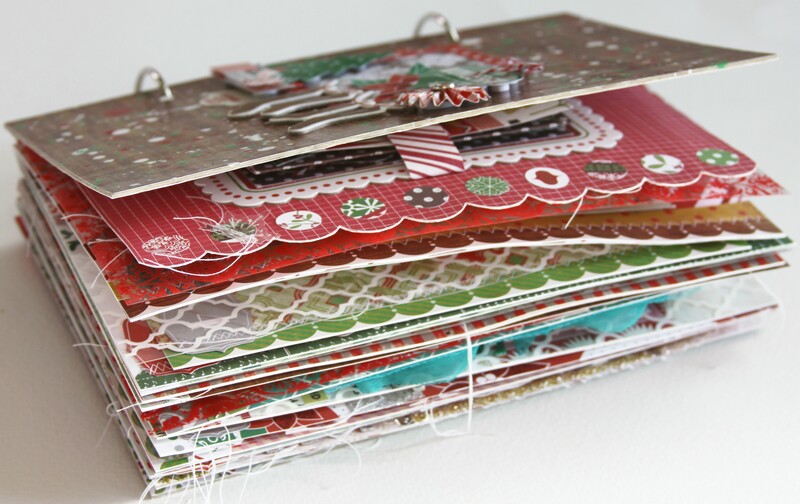 For Day 7, I used Peppermint St. Nick and Gingerbread Patterned Papers by Crate Paper, Paper Doily by Little Yellow Bicycle, Amy Tangerine Goodness Printed Chipboard Thickers by American Crafts, and my Black Zig Writer Pen for my journaling. For Day 8, I used Peppermint St. Nick and Gingerbread Patterned Papers, Paper Doily by Little Yellow Bicycle, Hollyday Elf Glossy Chipboard Thickers (white with little black polka dots) by American Crafts, and my Black Zig Writer Pen for my journaling. For Day 9, I used Peppermint Ski Lodge and Embellish Patterned Papers and Chipboard Accents by Crate Paper, Paper Doilies and Jewels Stickers by Little Yellow Bicycle, and the falling snowflakes are from the White (R592) Holiday Reindeer Rub-Ons by Hambly Screen Prints. 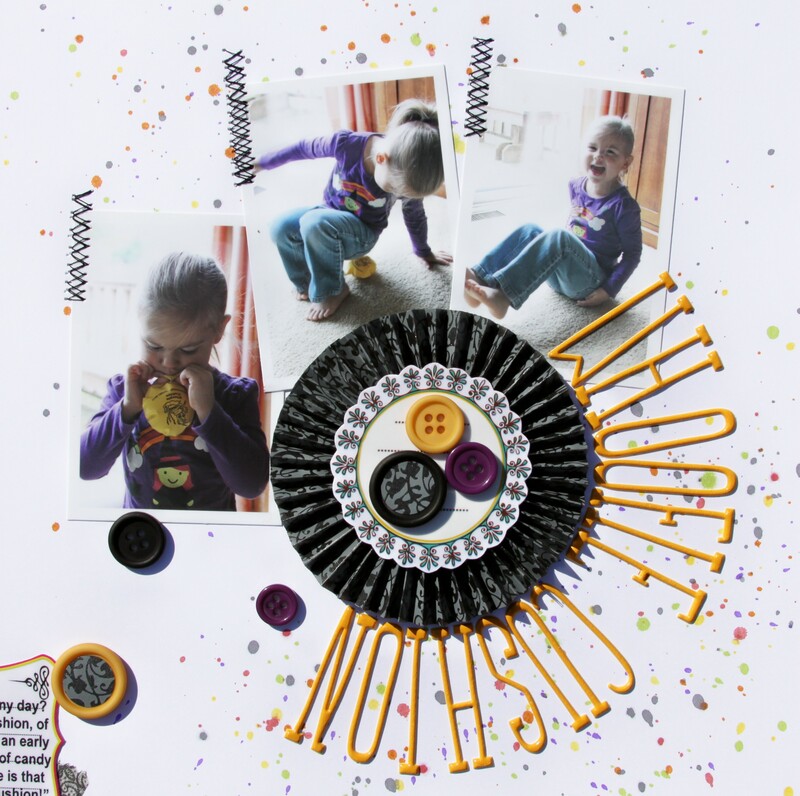 Mod Podge, Black Zig Writer Pen, Zig 2-Way Glue Pen, Mini and Memory Book Glue Dots, Herma Tabs, Circle Foam Tabs by American Crafts, Sunburst Punch by Martha Stewart Crafts, scissors, white thread, and sewing machine. 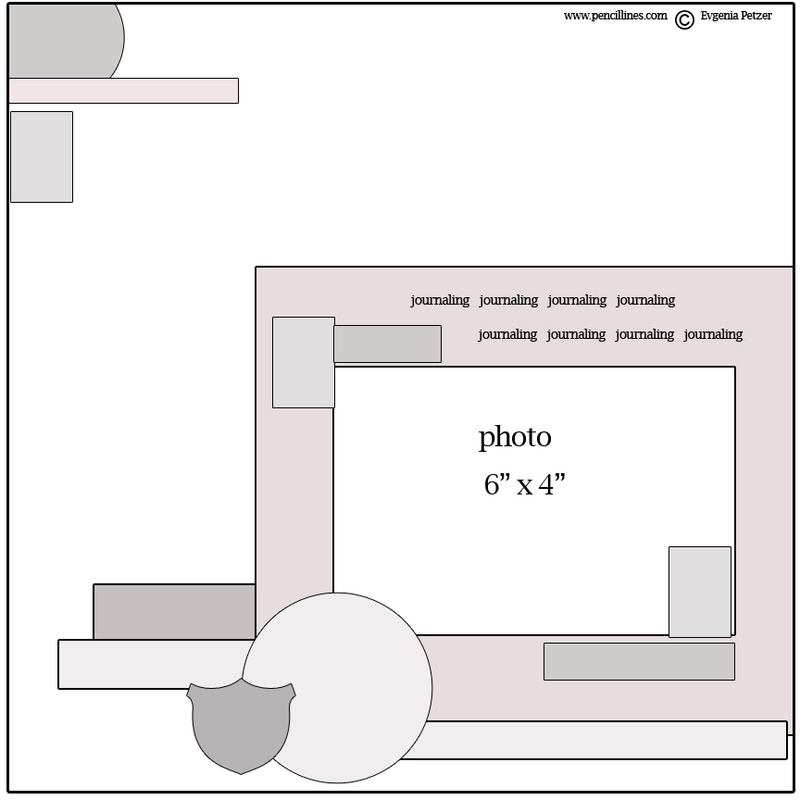 I wanted to share this LO with you that I made using Pencil Lines Sketch 256 over at the Pencil Lines Blog. Caitie had a Halloween Costume Party at school called the Monster Bash. 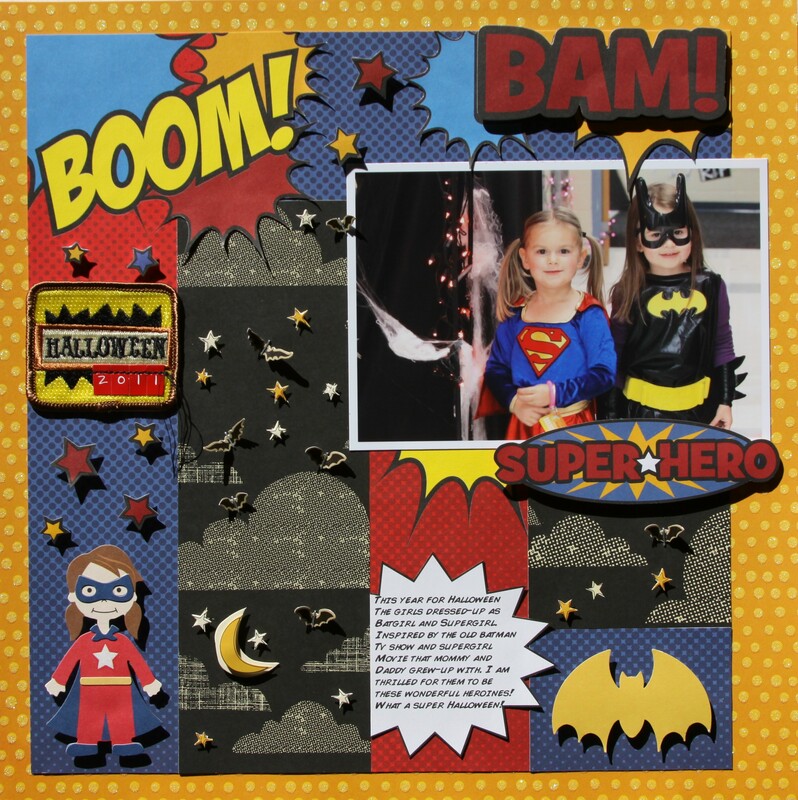 Caitie dressed up as Batgirl for Halloween this year and Payton dressed up as Supergirl. They enjoyed games, candy, prizes, popcorn, arts & crafts, a cake walk, and of course hanging out with friends. It was a really fun party! I took this photo of Caitie after the Monster Bash and I LOVE it! It’s fun. The girls cannot wait to go trick or treating. 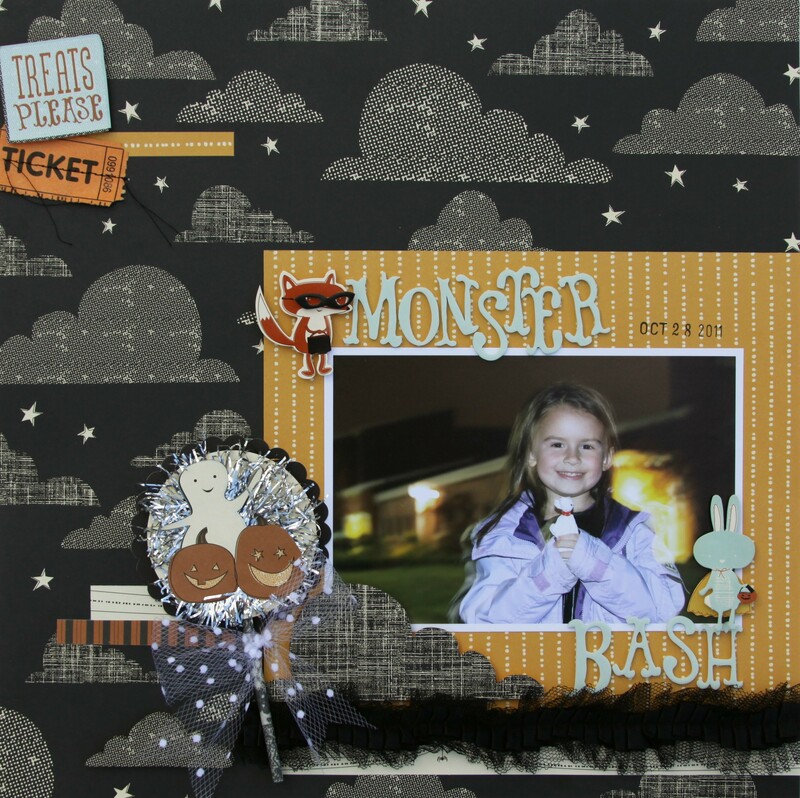 I added a ticket that I kept from the Monster Bash. I love the ghost lollipop that Caitie made at the Bash (its in her hands in this LO photo). I just had to make my own for this page. 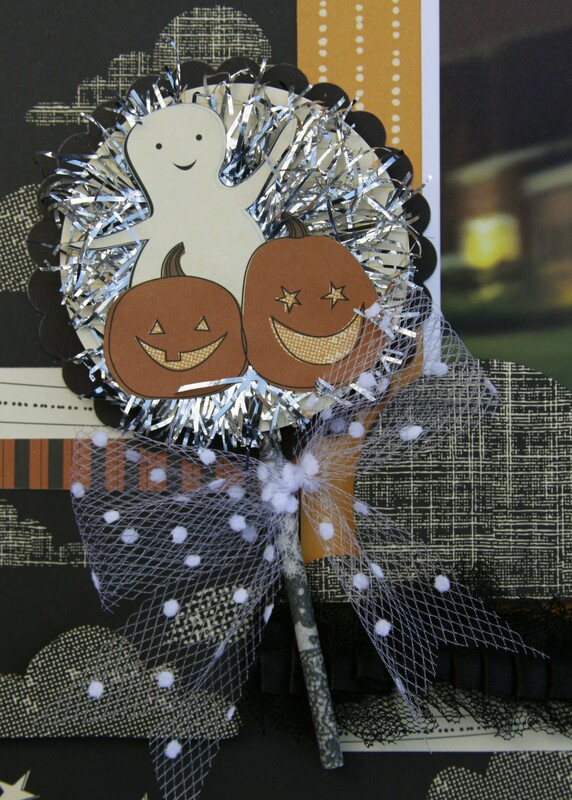 So, here is a close-up of the ghost lollipop embellishment I made. I had fun making this and it was really easy. 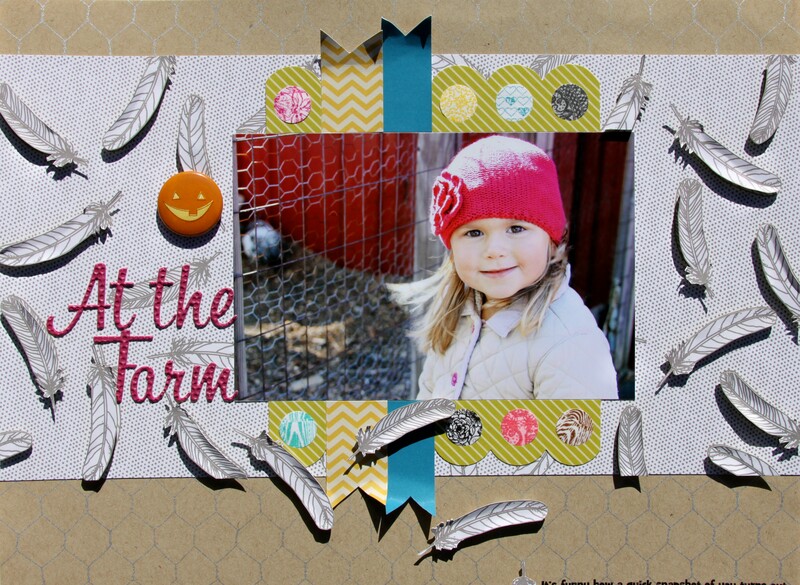 I used the Grey Doily Washi Tape by Hambly on the lollipop stick. I wanted to share this LO with you that I made using Pencil Lines Sketch 254 over at the Pencil Lines Blog. 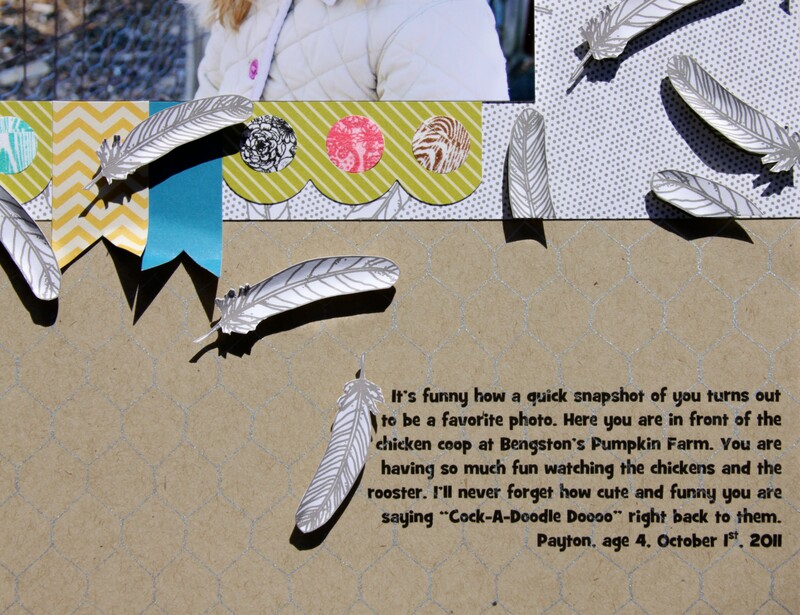 I turned this sketch on its side so I can fit it to this horizontal photo of Payton at the pumpkin farm. She was so happy looking at the chickens and rooster and I called her name and Click! It happened so fast. I LOVE this photo of her. Pretty Computer Font Time! I used GrilledCheese BTN for the journaling on this LO. It’s a fun and cute kid font. 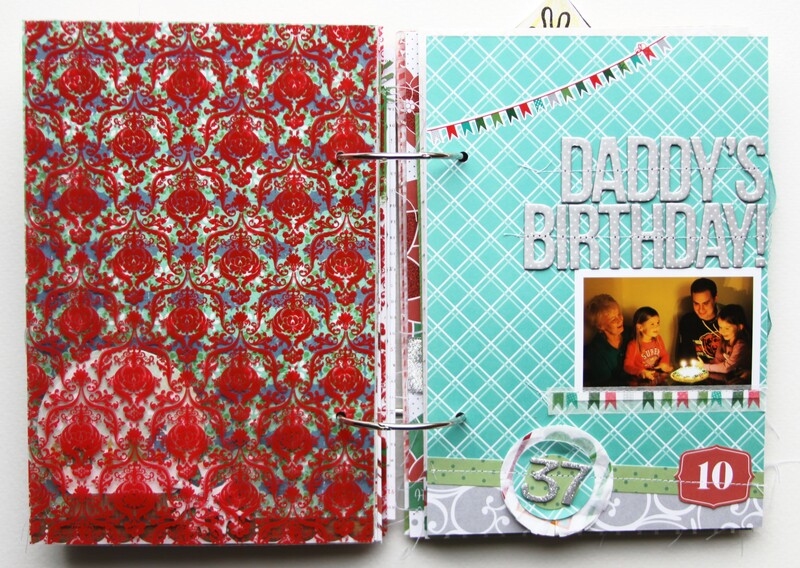 This time I printed off my journaling right onto the patterned paper. I wanted to share this LO with you that I made using Pencil Lines Sketch 255 over at the Pencil Lines Blog. Payton received an early Halloween present and just loves playing with the whoopie cushion. I took some pics of her playing with it on a recent rainy day. 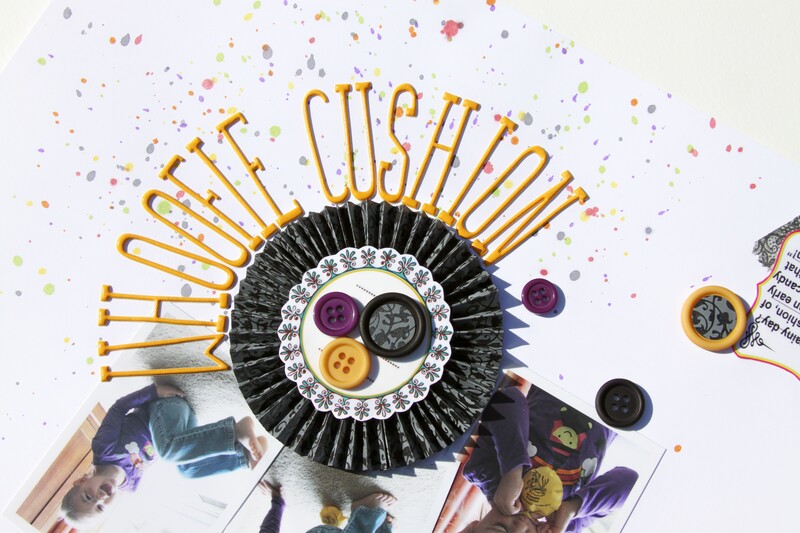 I just had to make a page out of this, because her calling it a “whoofie” cushion is just hilarious! I started this LO by first spray inking it using 6 different Glimmer Mists by Tattered Angels: Fully Purple, Graphite (gray-black), Key Lime Pie (light green), Starfish (pink), Tiger Lily (orange), and Yellow Daisy. 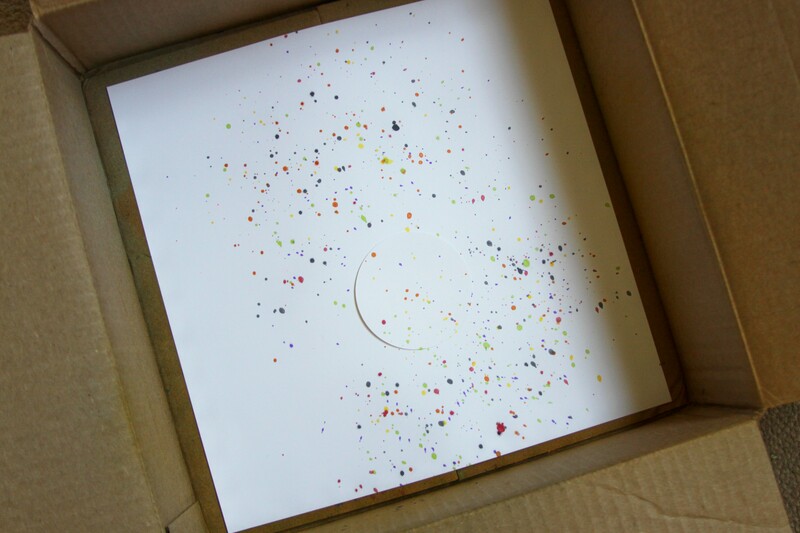 I just used a box that came with a 2peas order for the inking. 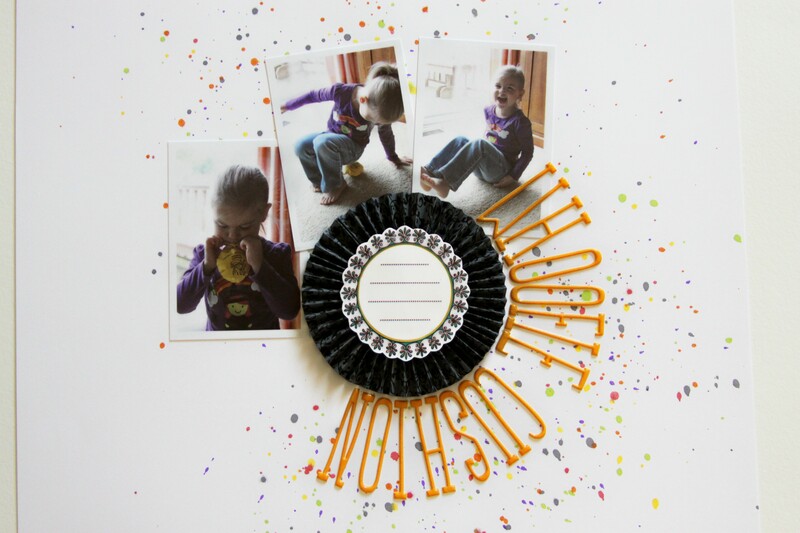 I also placed a 3″ circle punched piece on my LO so I knew where to place my finished pinwheel. Just For Fun (not to be crude), the spray ink was playfully done to be the “pssst” of the whoopie cushion. tee hee. 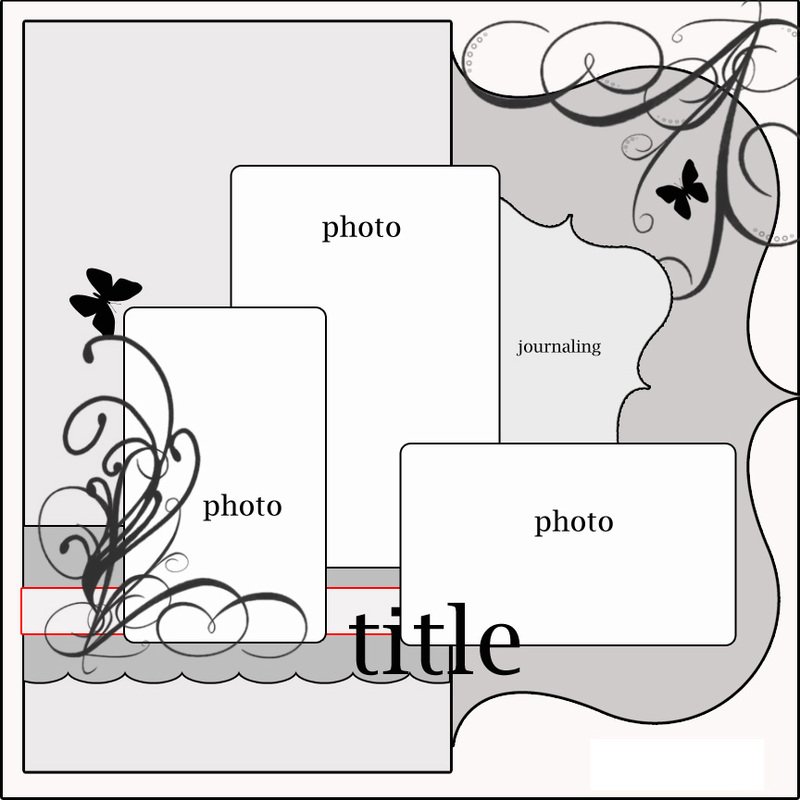 Next, I added my pictures. 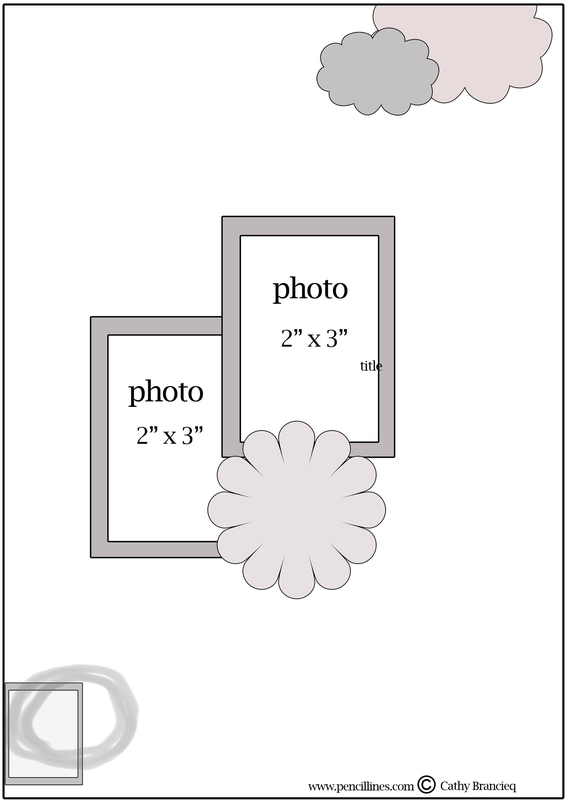 I chose to add 3 pics instead of the 2 on the sketch to tell this story. I also added my pinwheel. To make this pinwheel: I used the High Tea Patterned Paper by Hambly Screen Prints. I just love the gray, black vines, and shine on this paper. It went perfectly with my halloween theme. I wanted my pinwheel to be about 3 inches wide. 1. 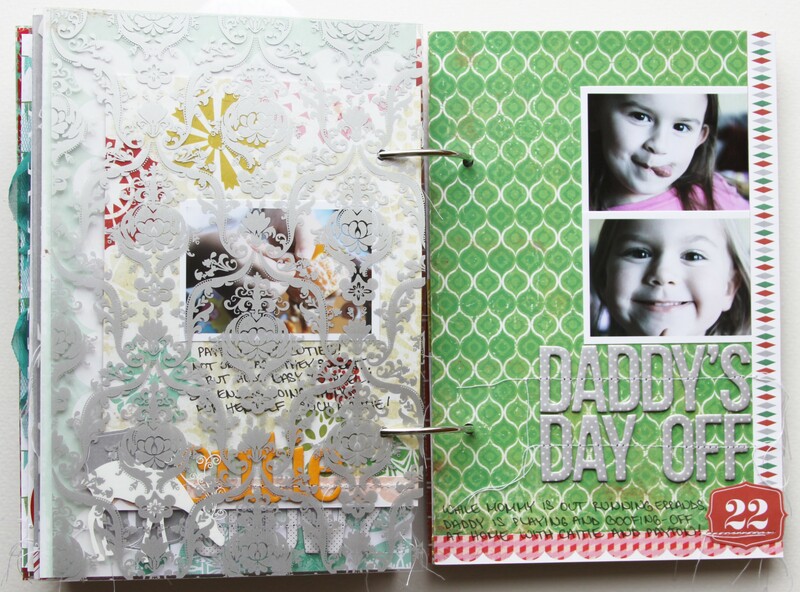 I cut the paper into 2 – 1.5 x 12″ strips using my Fiskars paper trimmer. 2. 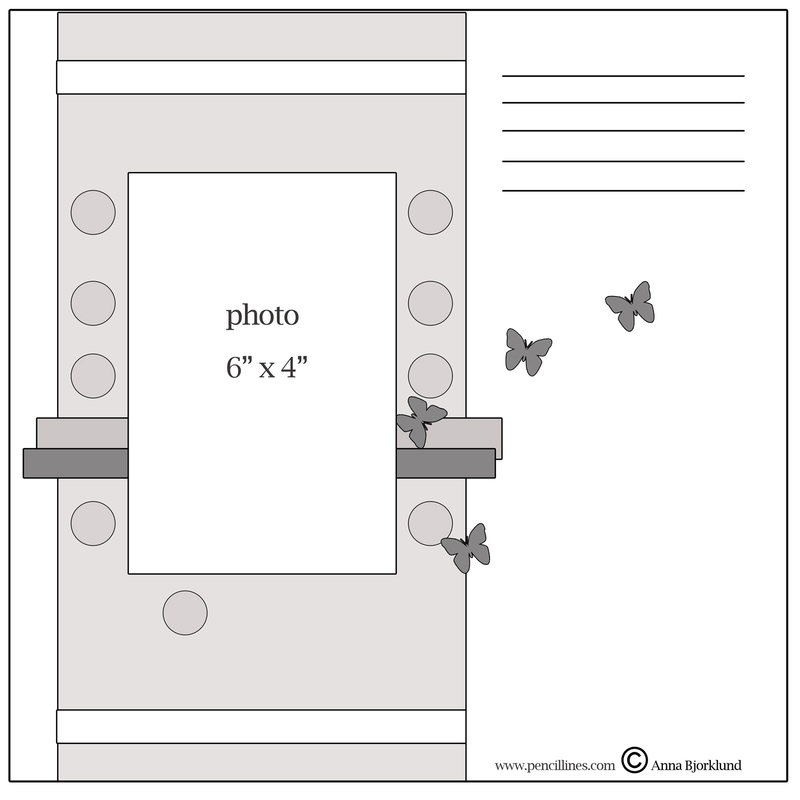 I scored the paper strips using my Martha Stewart Scoring Board. I folded them up and attached the ends to each other using Mini Glue Dots. 3. I shaped it into a circle and placed it onto a 2.5″ Gluber. I LOVE the way it looks. It’s SO pretty! 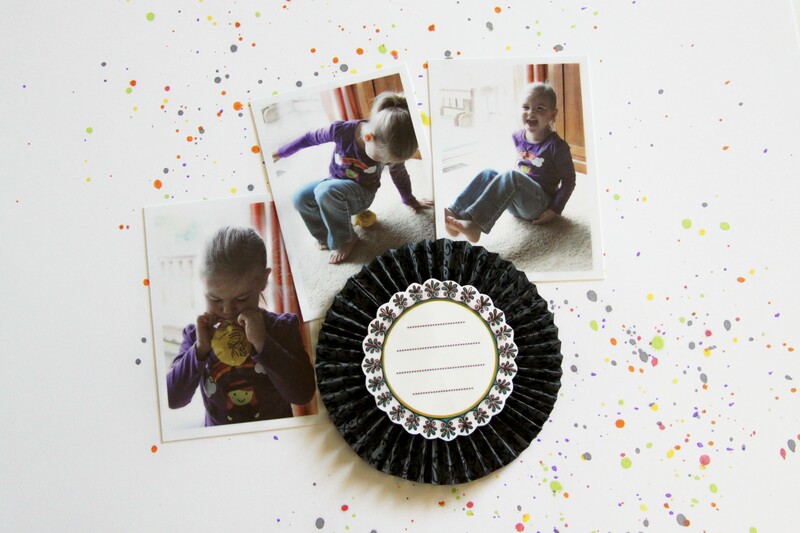 I, then, added the Hambly Clear Sticker to the white cardstock, cut around the decorated edges of the sticker, placed it onto a 2″ Gluber, and pressed it onto the pinwheel. 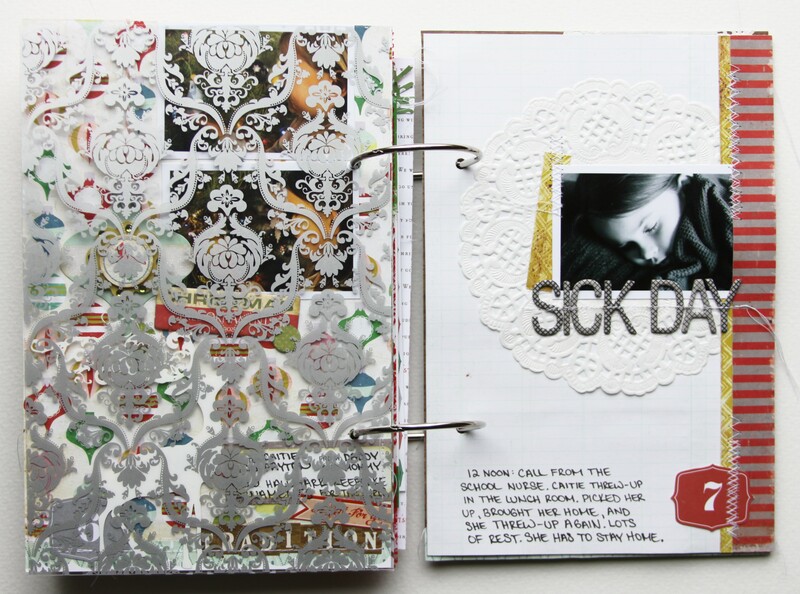 Then, I added my title using the American Crafts Thickers. 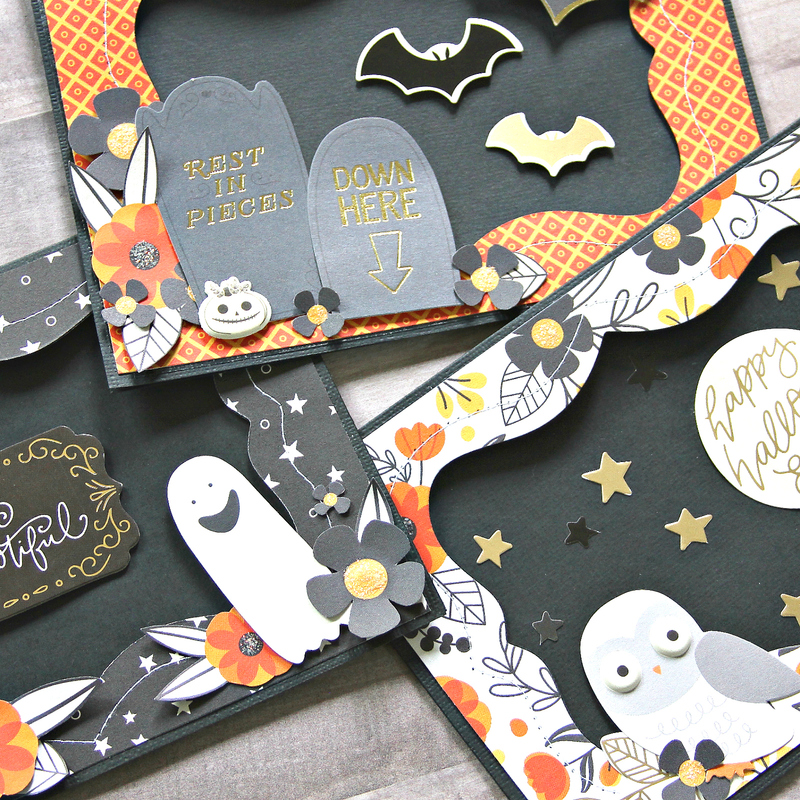 These Maple letters from the Nightfall Collection had such a fun font and halloween color. No…that’s not a typo. Payton calls a “whoopie” cushion a “whoofie” cushion. I love it…I laughed so hard when I first heard her say it. I knew I had to do this page. 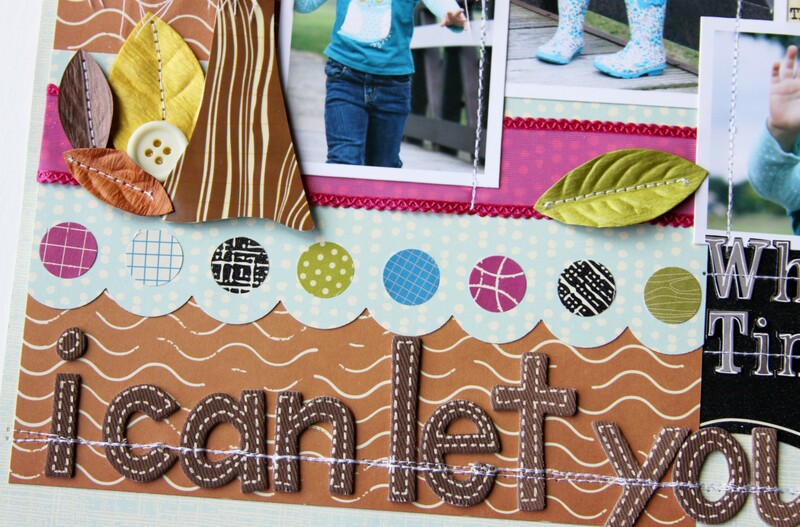 I made Washi Tape Letters for this LO. 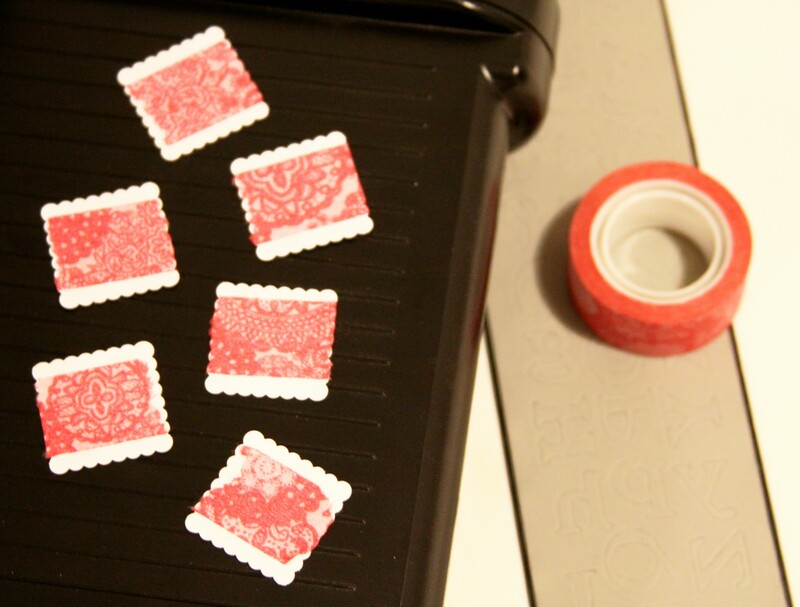 I LOVE the color and design of this Pink Doily Washi Tape by Hambly Screen Prints! Payton LOVES pink! I wanted her laughter on this page. It was so easy to make. 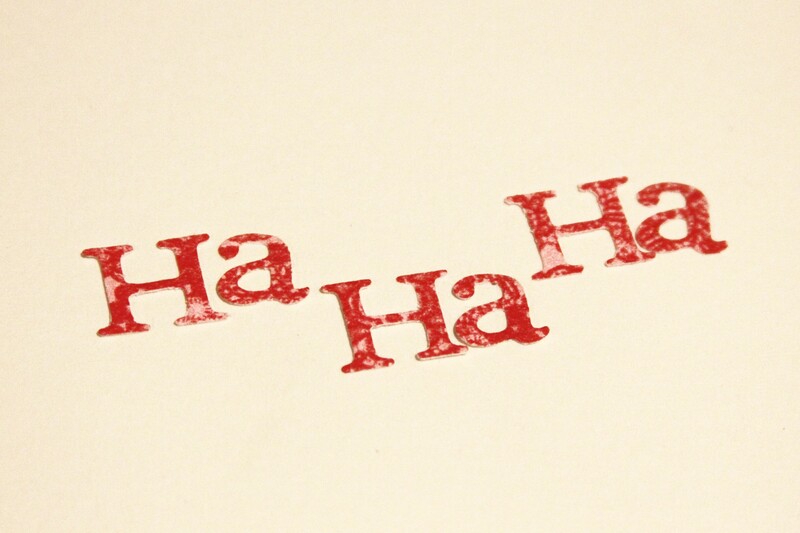 Here’s how I made the “Ha Ha Ha” on my LO: I started with a 1″ square punch and punched out six squares out of the white cardstock. The 3/4″ wide size of this Pink Doily Washi Tape was the perfect size for these letters. I covered the squares with strips of the tape. I placed it Washi Tape-side down onto the Sizzix letter die and used my Sizzix Big Shot to cut up all the letters I needed. How Pretty are these letters!? Again, Just For Fun (not to be crude)…these stitches were the last added touch to this LO. My “Pretty Version” of some stink lines. LOL! Funny, huh!? Great Idea…Thanks, Chris! Pretty Computer Font Time! 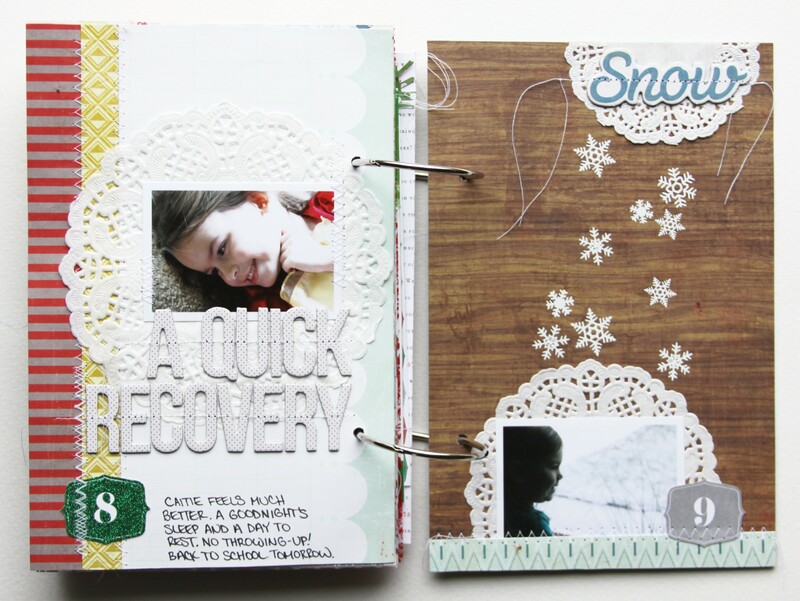 I used Arial Narrow (Bold) for the journaling on this LO. I printed off my journaling on the white cardstock and added the Hambly Clear Sticker right over it. I LOVE it! It looks so nice accented with more Washi Tape (Grey Doily) by Hambly and the button with the pretty High Tea Patterned Paper by Hambly. 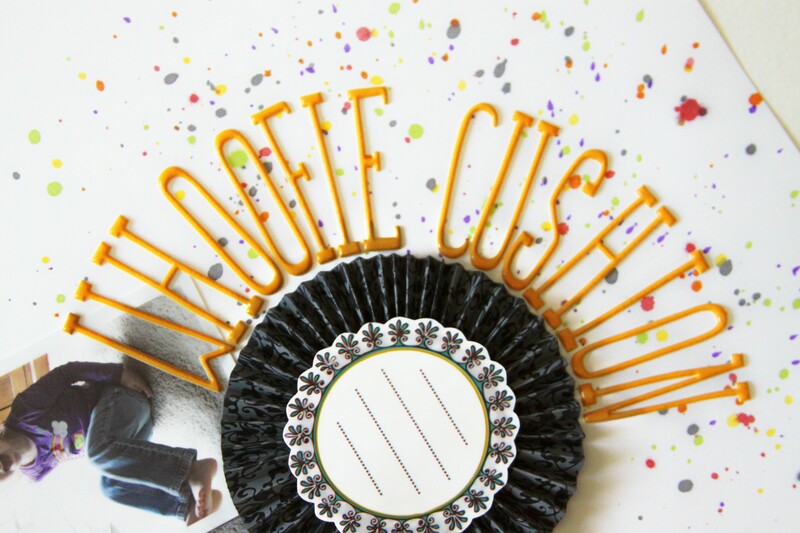 BTW, I used the Circles Large Edger Punch by EK Success for the High Tea circles in the buttons. 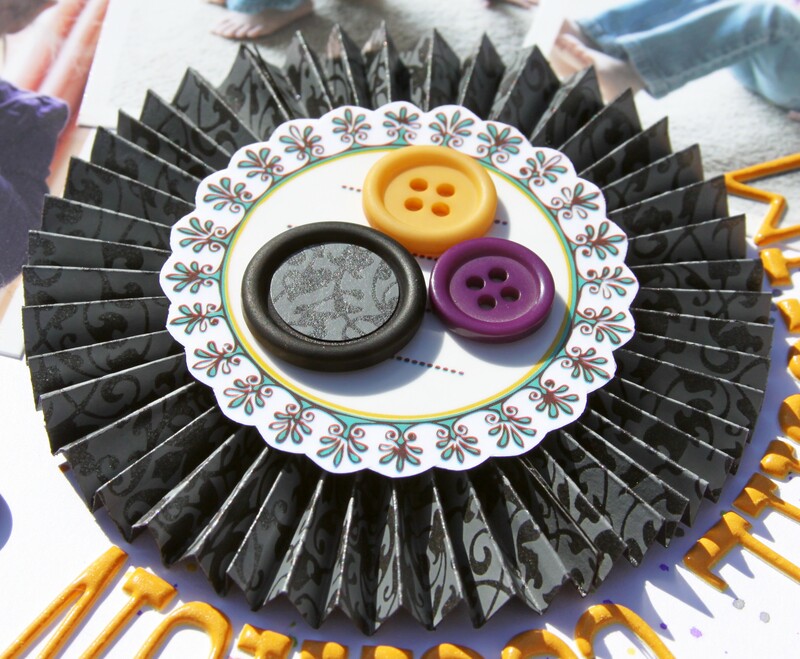 It was a perfect size for the largest buttons in that Nightfall Buttons Variety Pack by American Crafts. Here’s a better close-up shot of my pinwheel. Wow! Thank You! : ) ! I wanted to share my submission with you for the Pencil Lines Design Team try-out. 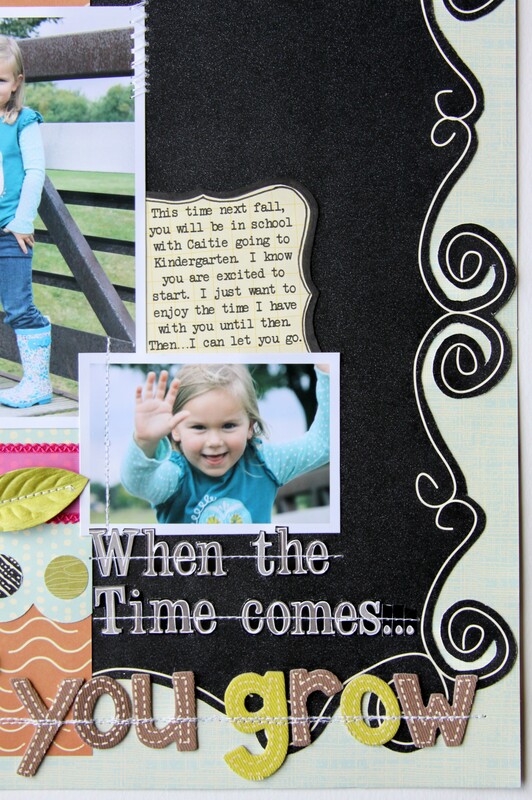 Some more scrap therapy for me…to prepare me for Payton to go off to school next year. My Gosh Time Flies! I did a little fall photo shoot with her before we picked-up Caitie from school. I took these pictures on the bridge next to the school. I love that we are just minutes from it and I enjoy this walk with both of them everyday! You can see it’s tough to get this kid to sit still. LOL! I got one amazing shot of her and then off she ran…silly girl. I love her so much. On her first day of school, there will be tears…but, I can let her go off into the world and grow-up. I will be ready then. My favorite trees are the Willow Trees. 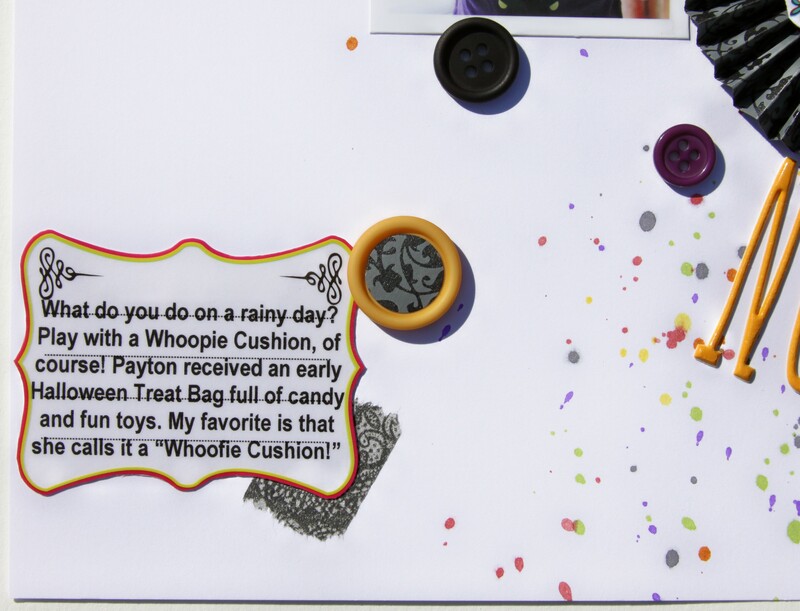 So, I used that as inspiration to create a tree embellishment that reflects Payton’s free spirit and just overall personality. I just love the way this tree turned out! Of course, when you sketch it out on paper it looks great. But, getting your idea out onto your LO is totally another thing. Thank goodness my idea worked out…I believe it is a tree that reflects Payton. 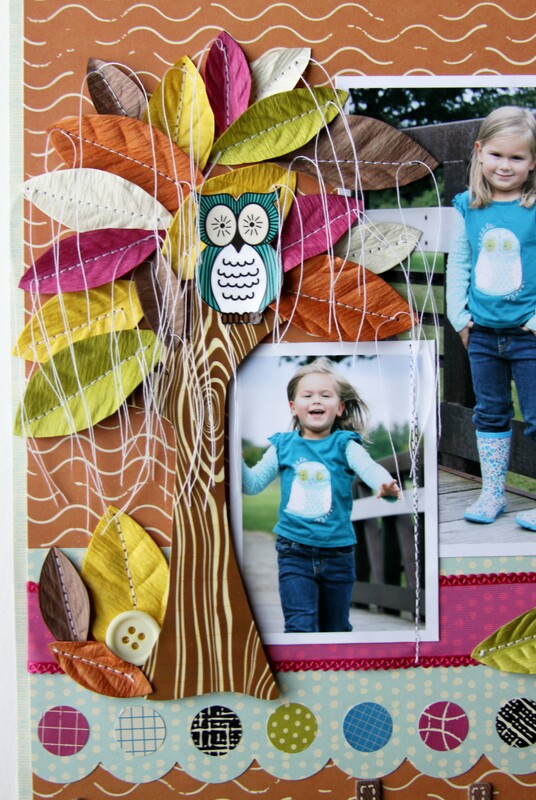 I love the whimsy of the leaves, the colors, the tree bark, and the owl (taken from the owl on Payton’s shirt…my favorite shirt on her). I attached the Owl Clear Sticker by Hambly Screen Prints to the Bright White cardstock by The Paper Company. 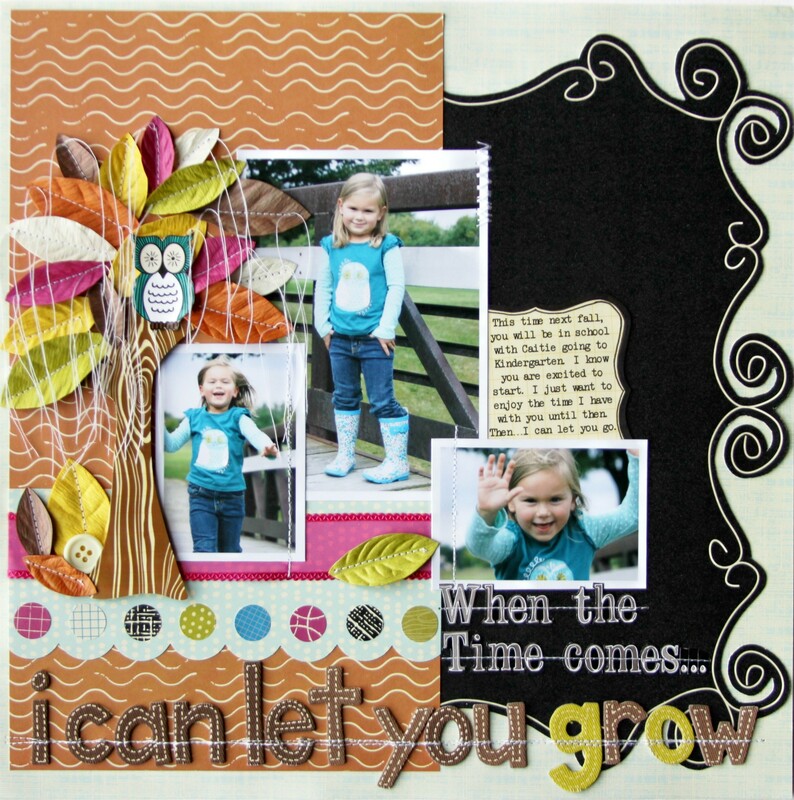 I attached the Tree Clear Sticker by Hambly Screen Prints to the Autumn Cider Patterned Paper by American Crafts. Of course, I used the Circle Foam Tabs to give them that 3D effect among the leaves. My journaling reflects exactly the way I feel at this moment. Pretty Computer Font Time! I used Another Typewriter (downloaded off the internet) for my journaling on this LO. 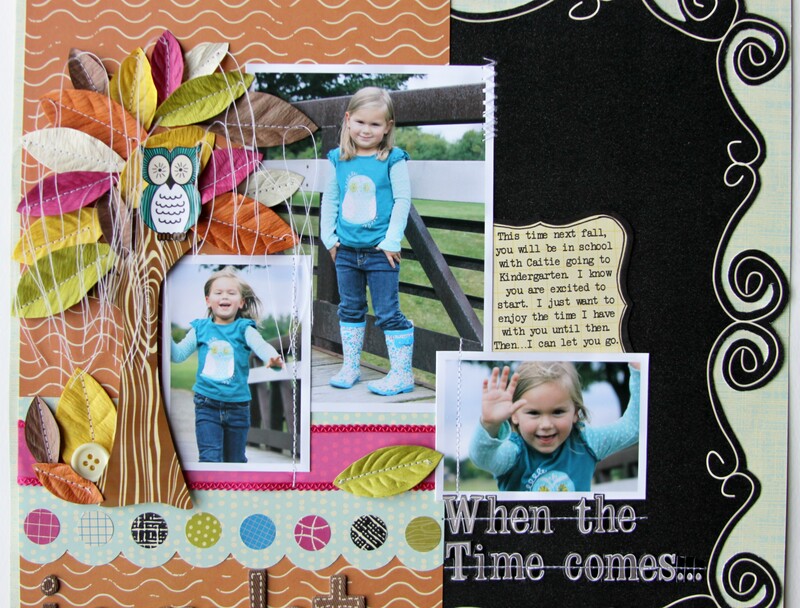 I used the Autumn Cider Patterned Paper again for my journaling tag. I used my Black Zig Writer pen to add brackets to the paper. 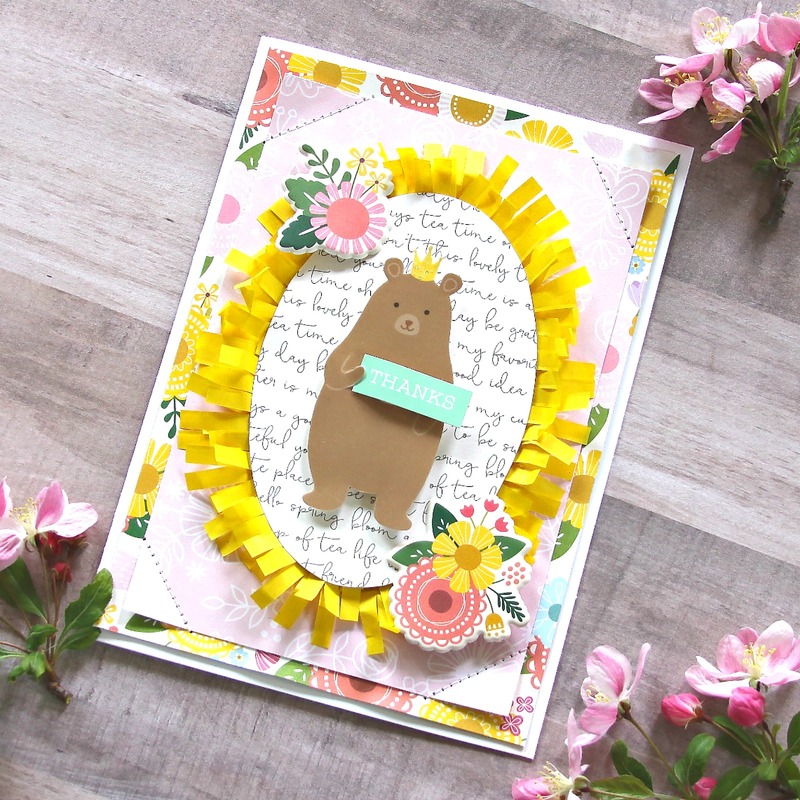 I combined the patterned papers and embellishments from the Nightfall and Amy Tangerine Lines from American Crafts. LOVE IT!